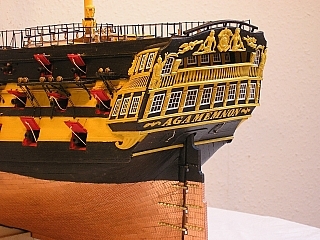 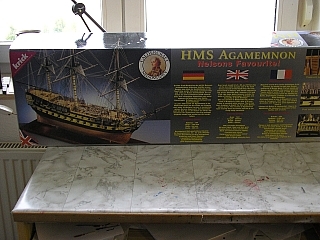 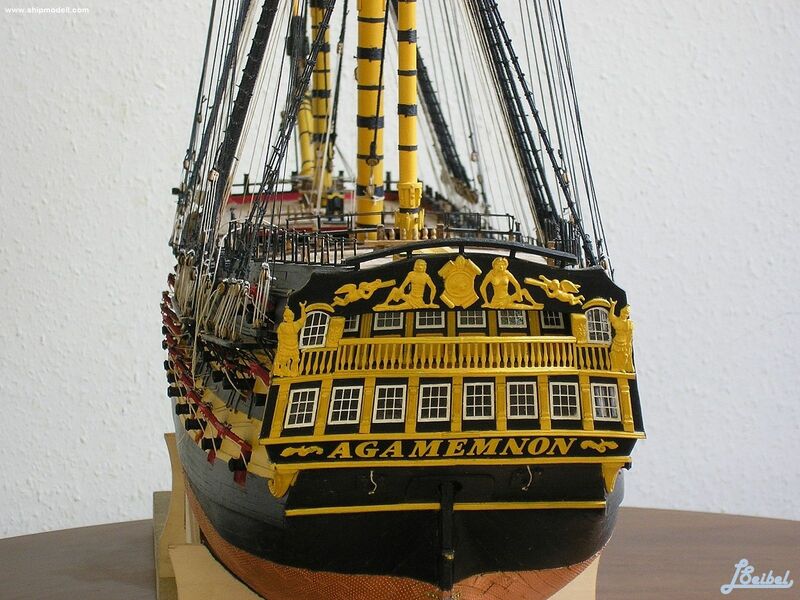 Vikipedia... HMS Agamemnon was a 64-gun third-rate ship of the line of the British Royal Navy. 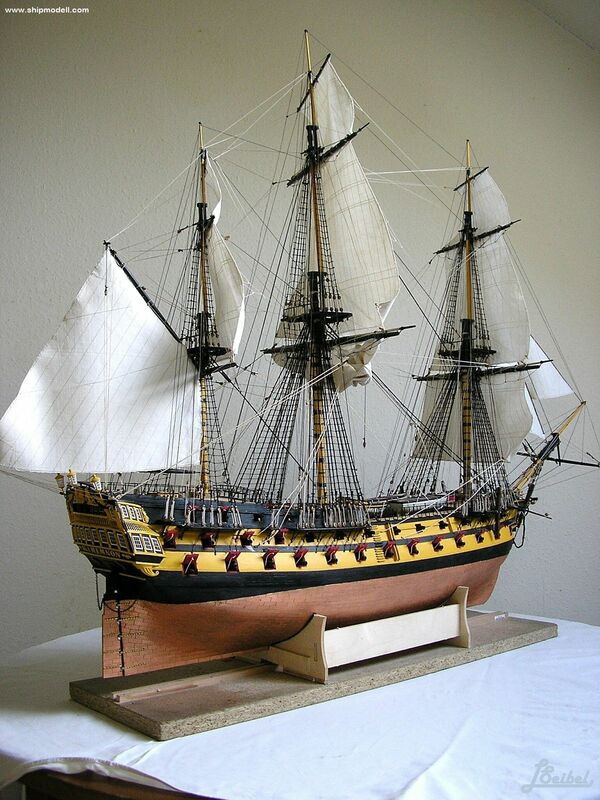 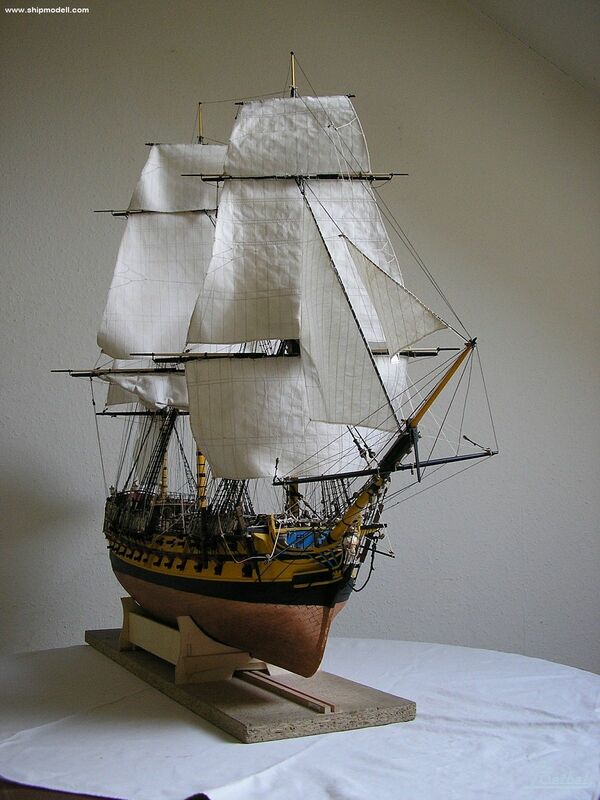 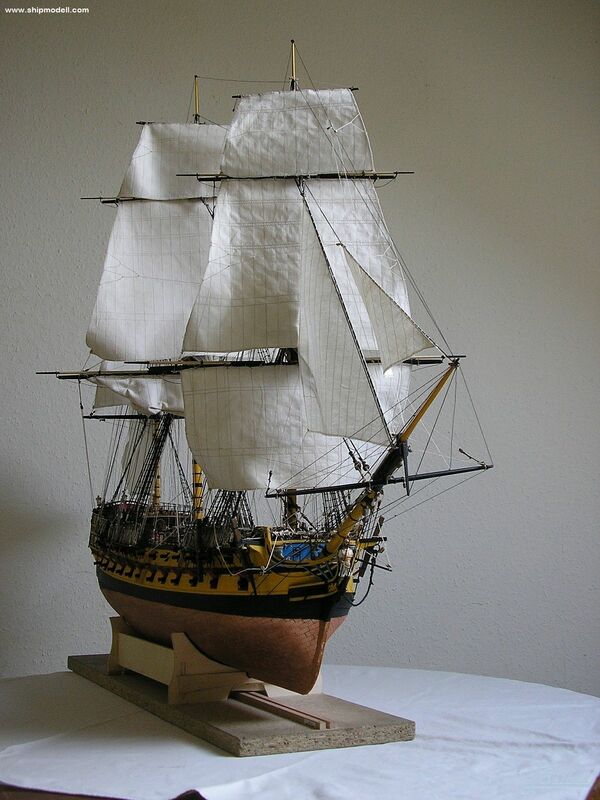 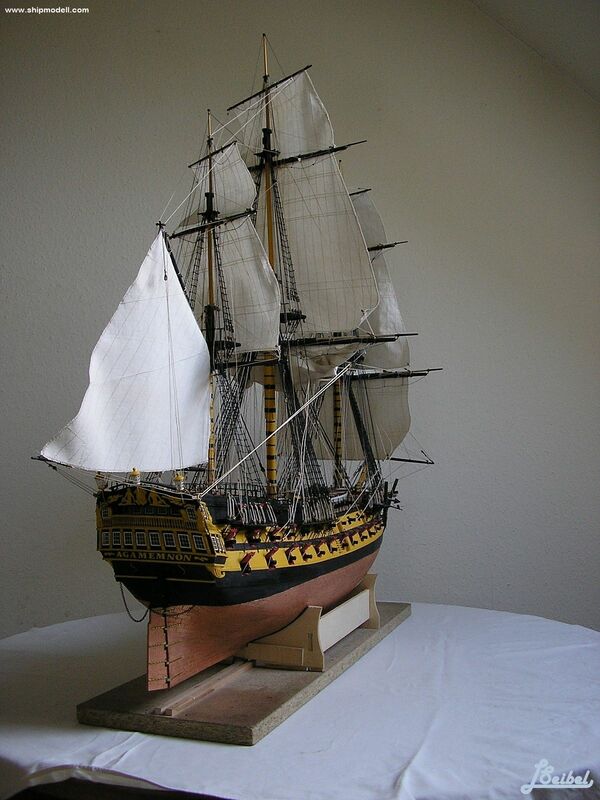 She saw service in the Anglo-French War, French Revolutionary and Napoleonic Wars, and fought in many of the major naval battles of those conflicts. 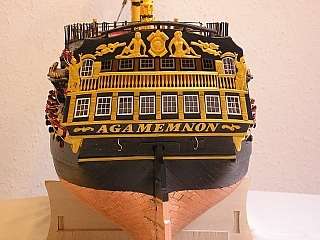 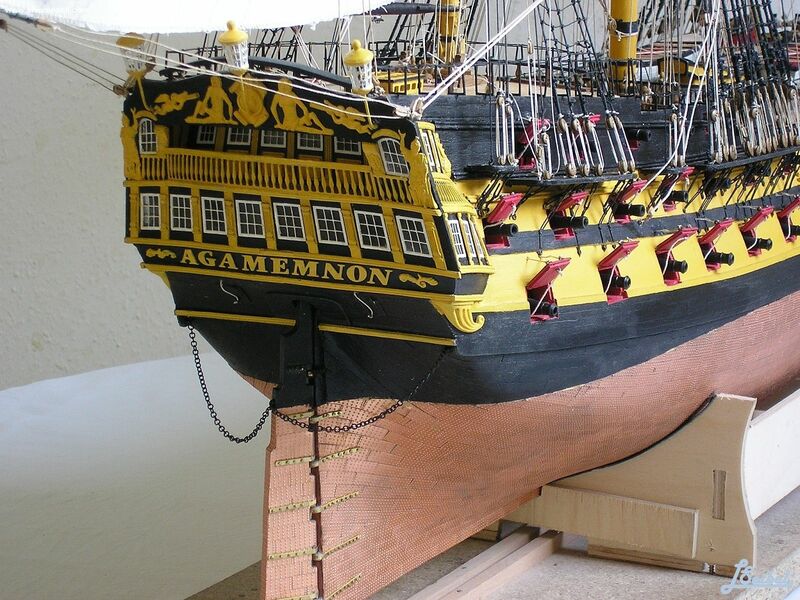 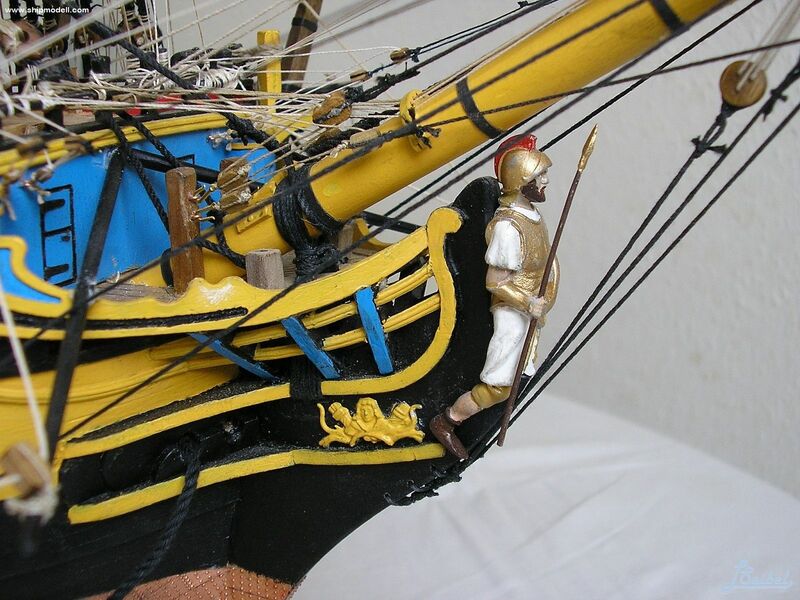 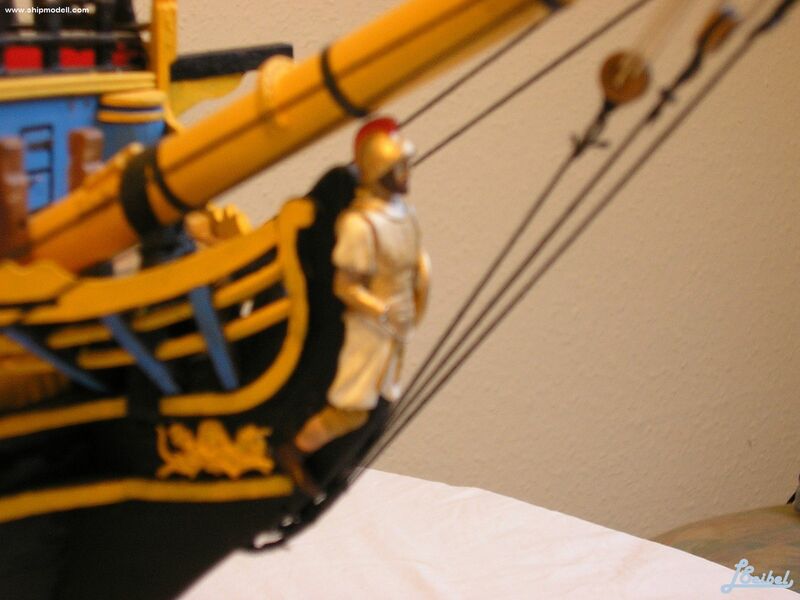 She is remembered as being Nelson's favourite ship, and was named after the mythical ancient Greek king Agamemnon, being the first ship of the Royal Navy to bear the name. The future Lord Nelson served as Agamemnon's captain from January 1793 for 3 years and 3 months, during which time she saw considerable service in the Mediterranean. 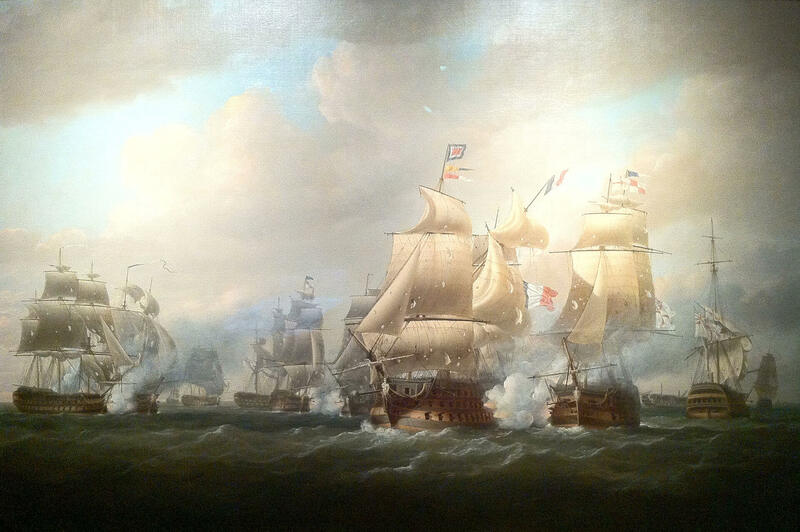 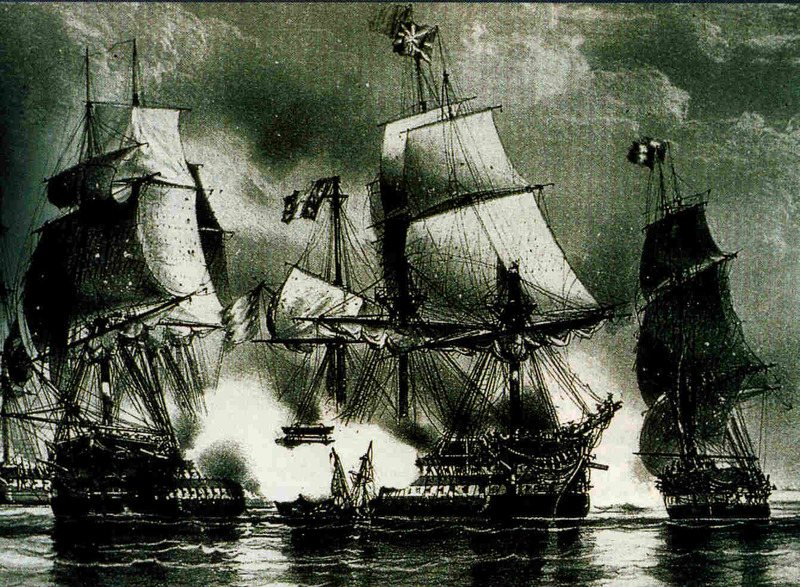 After Nelson's departure, she was involved in the infamous 1797 mutinies at Spithead and the Nore, and in 1801 was present at the first Battle of Copenhagen, but ran aground before being able to enter the action. 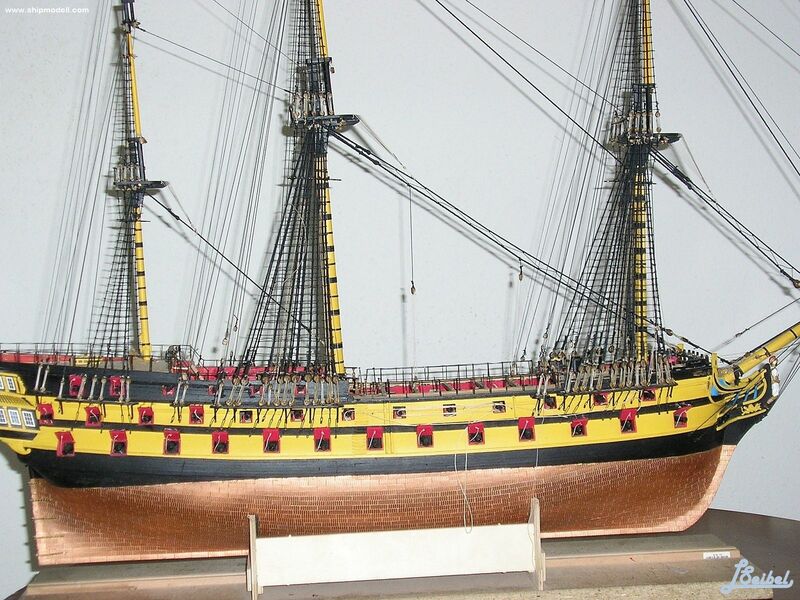 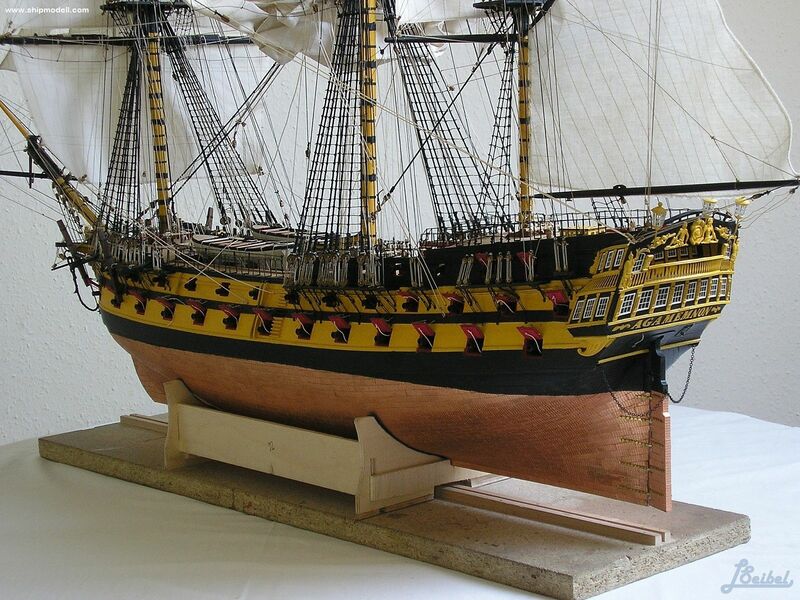 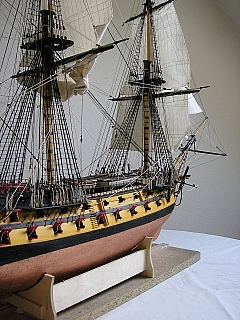 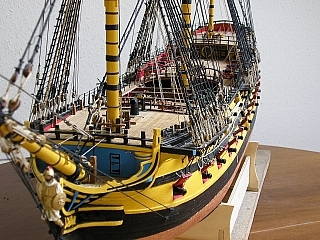 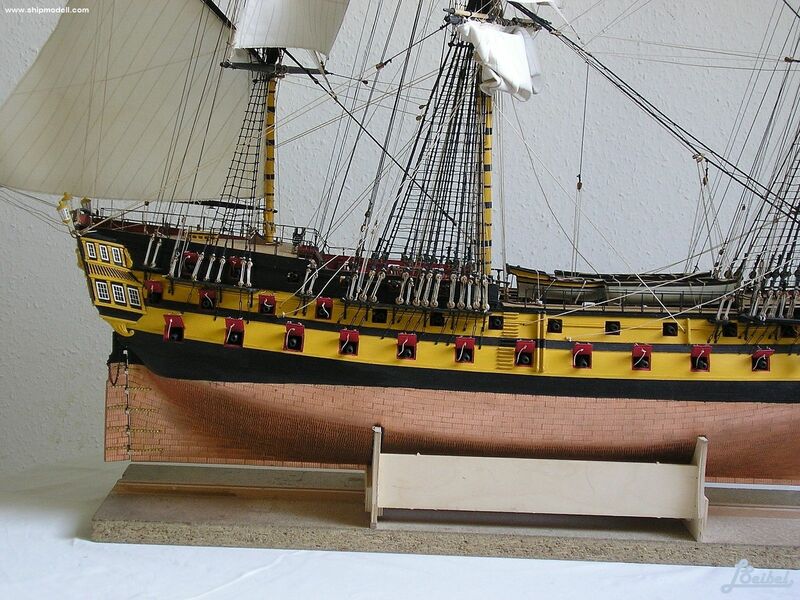 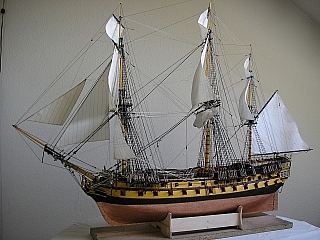 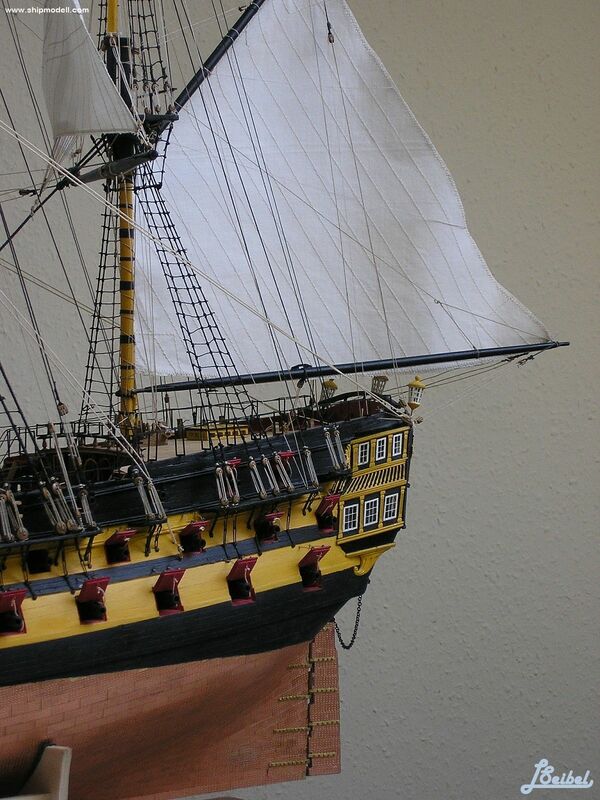 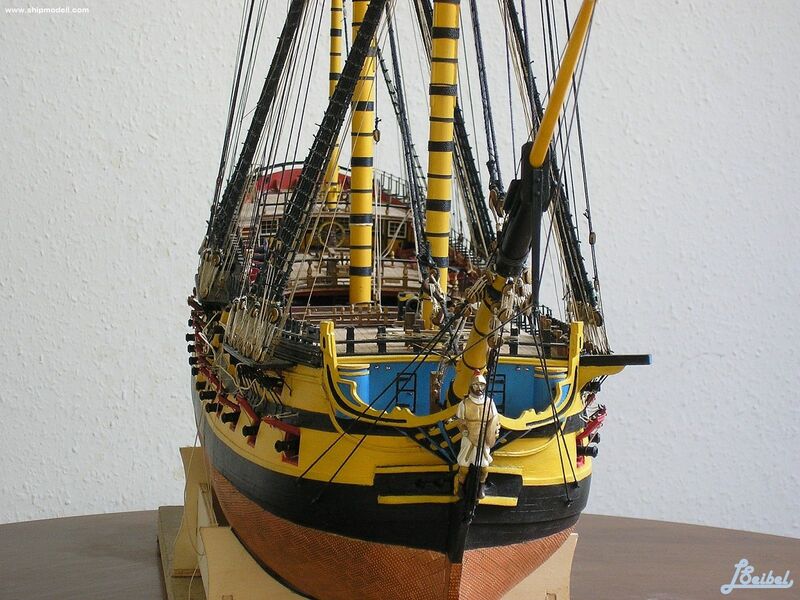 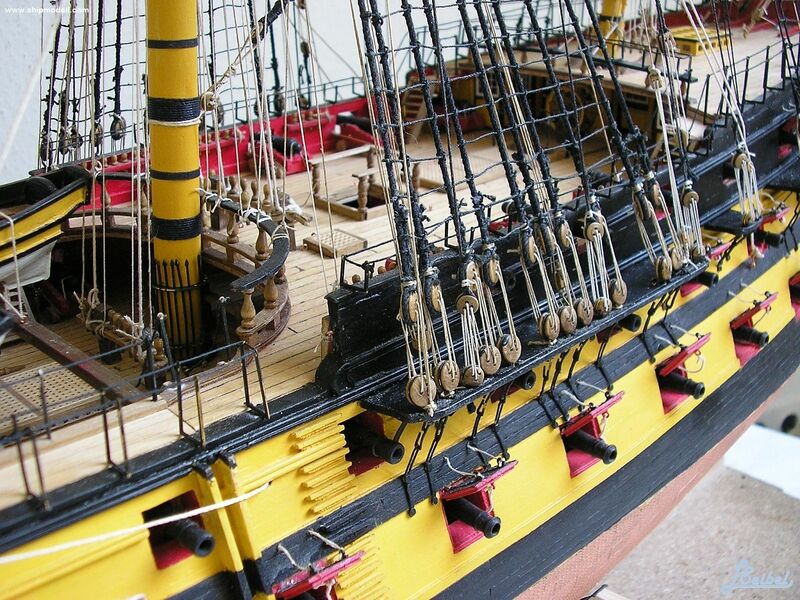 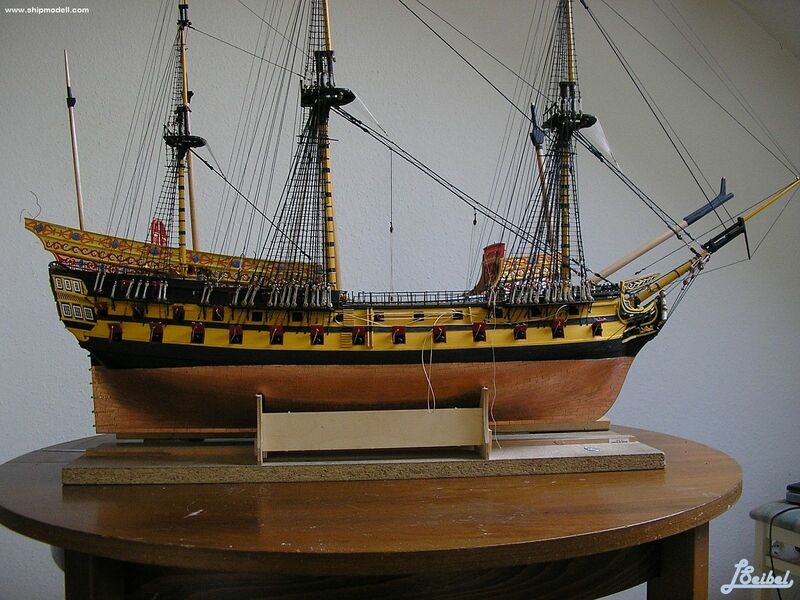 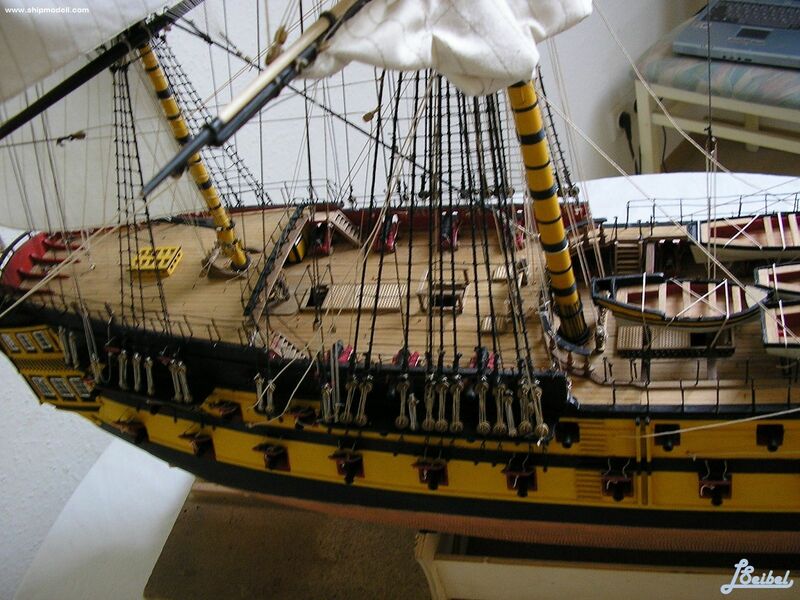 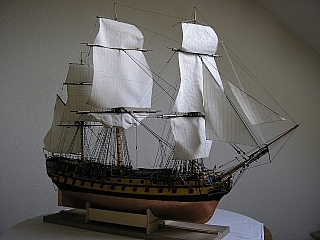 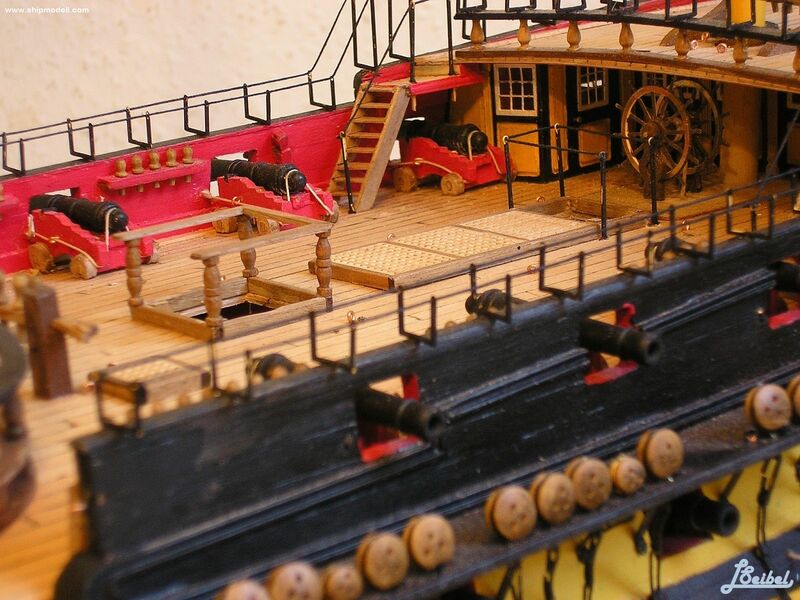 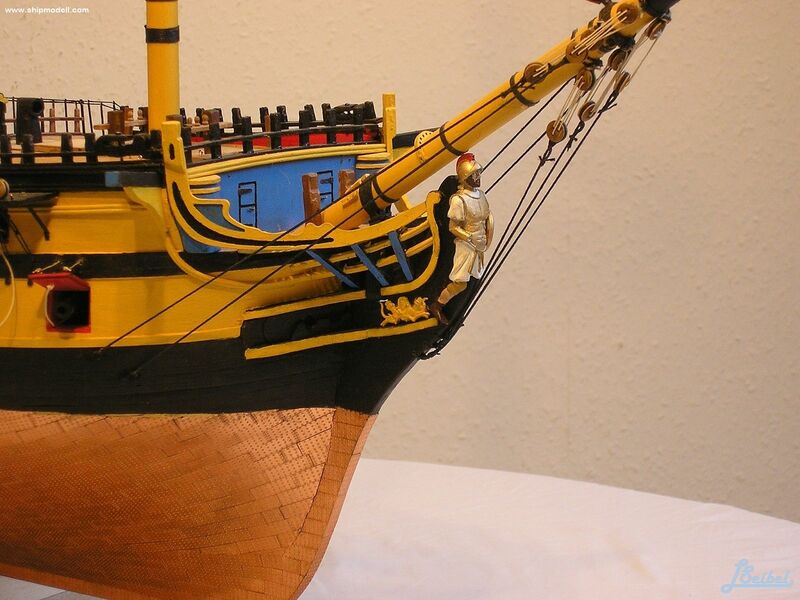 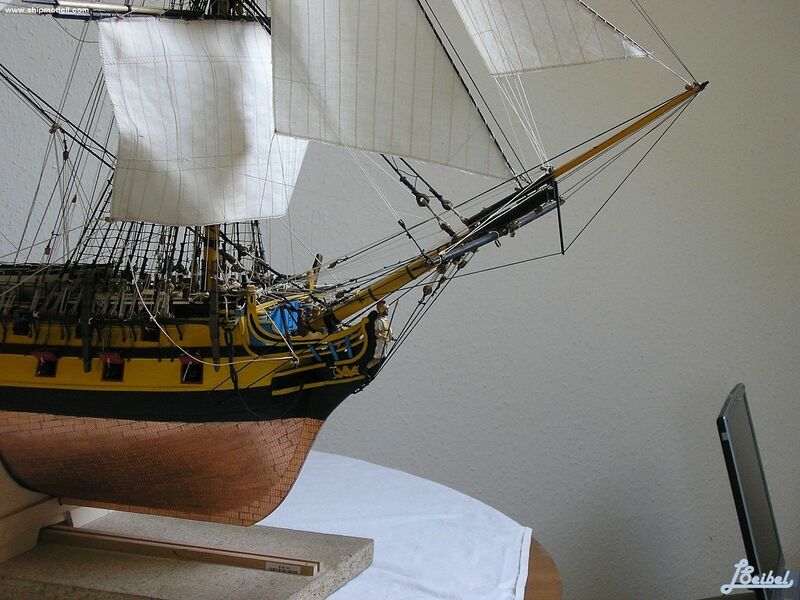 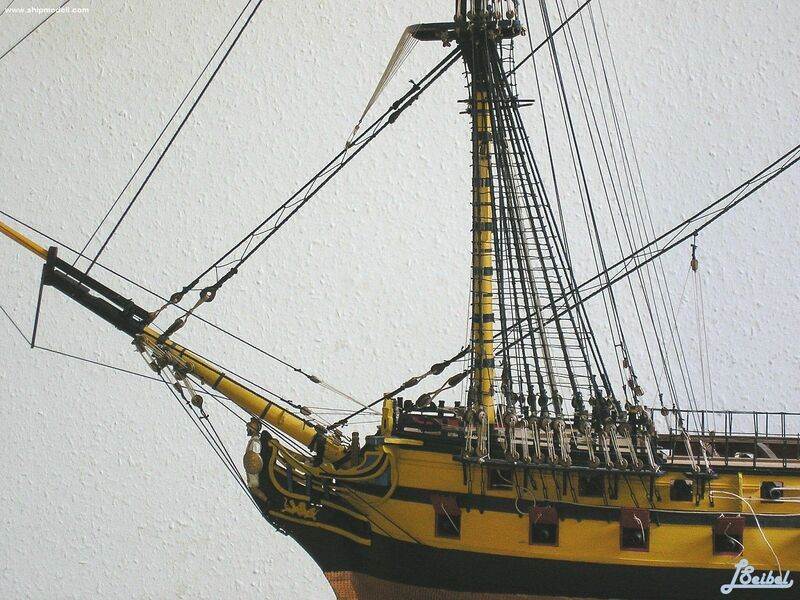 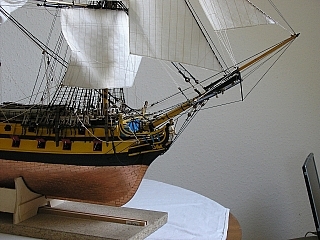 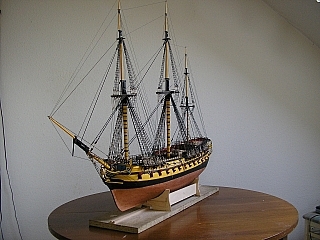 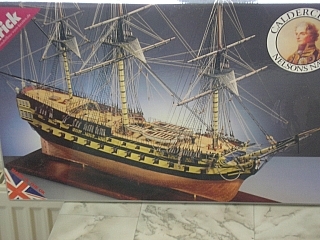 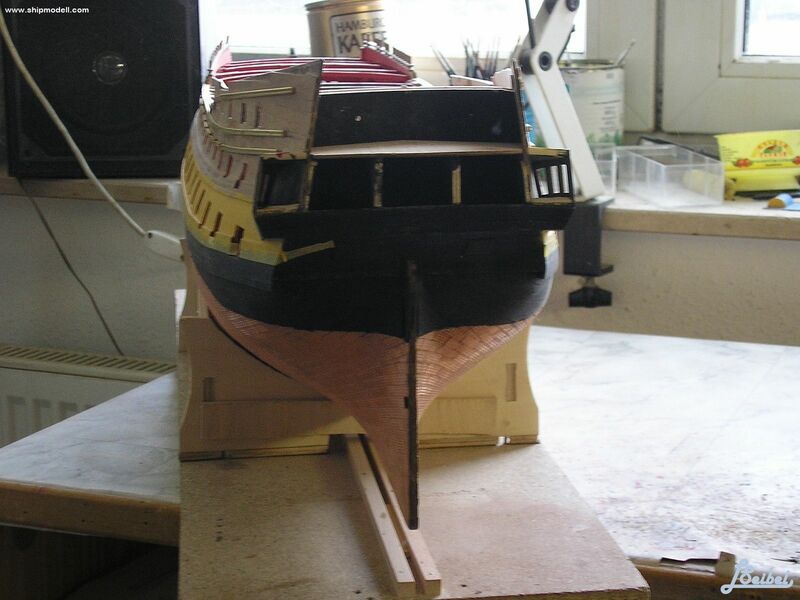 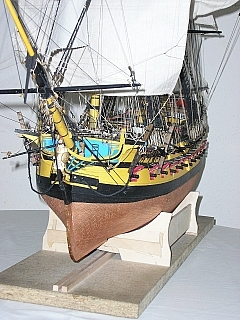 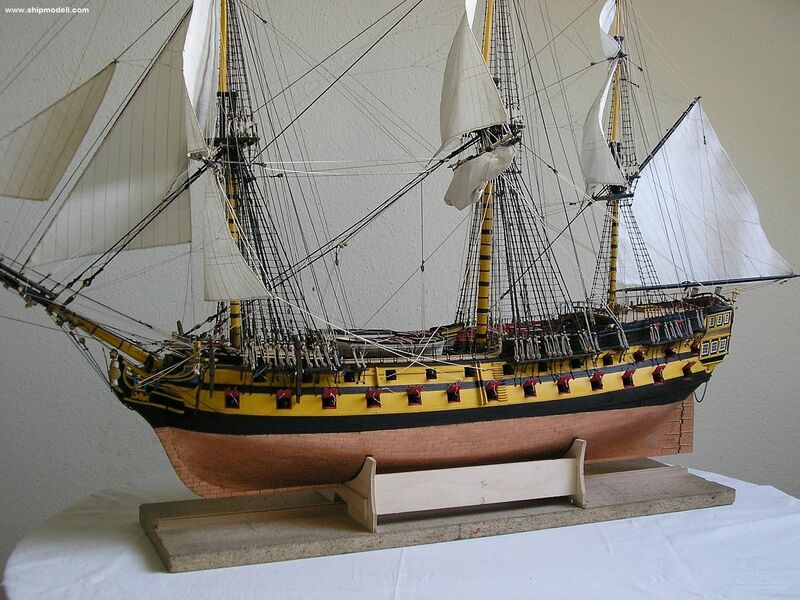 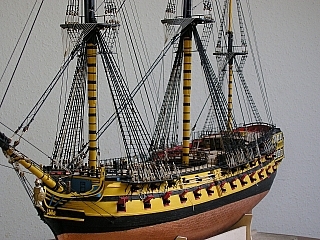 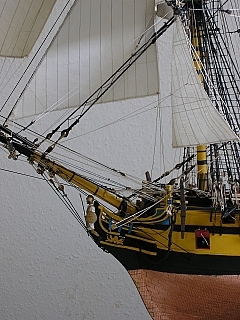 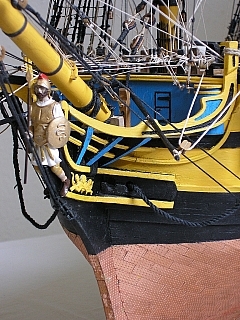 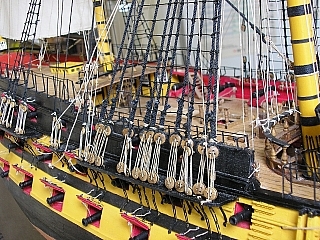 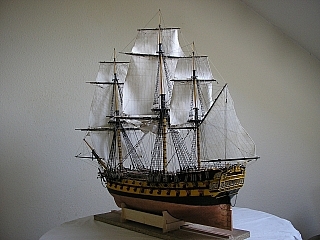 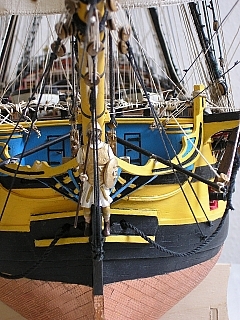 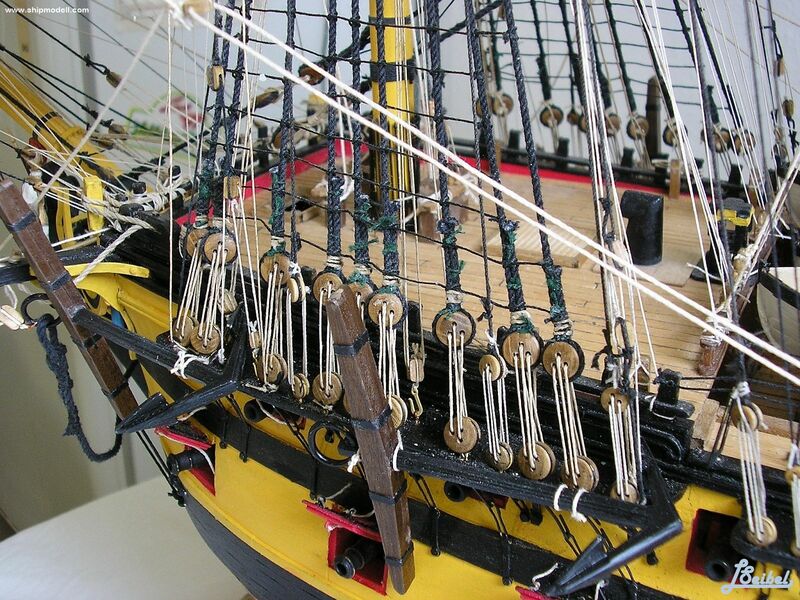 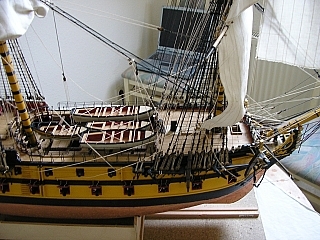 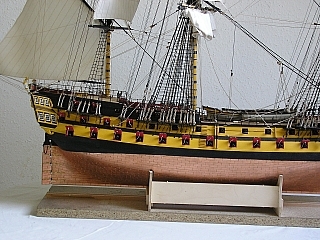 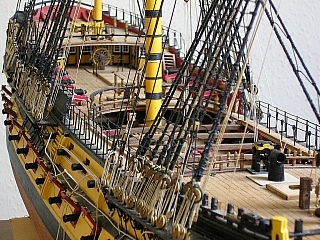 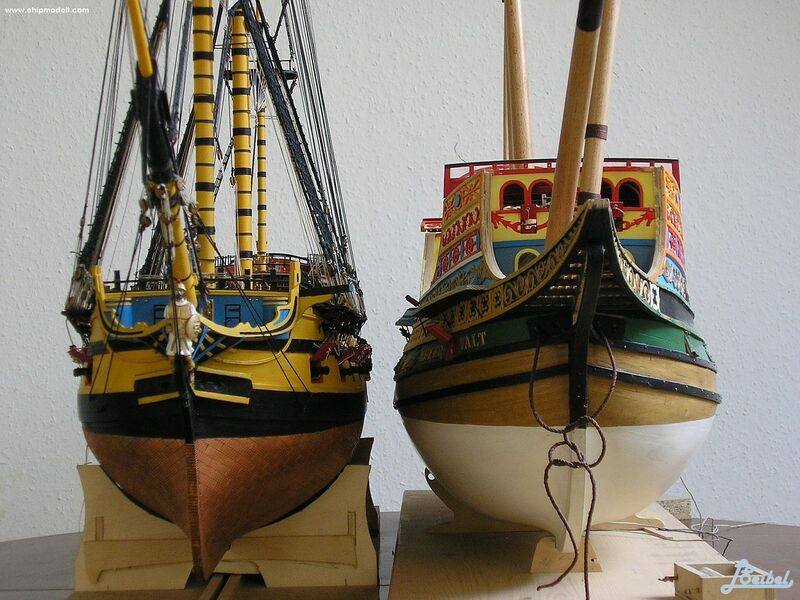 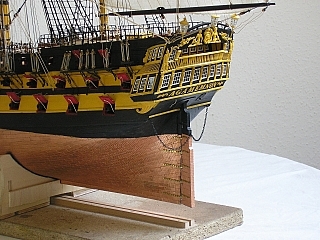 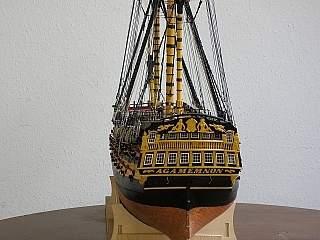 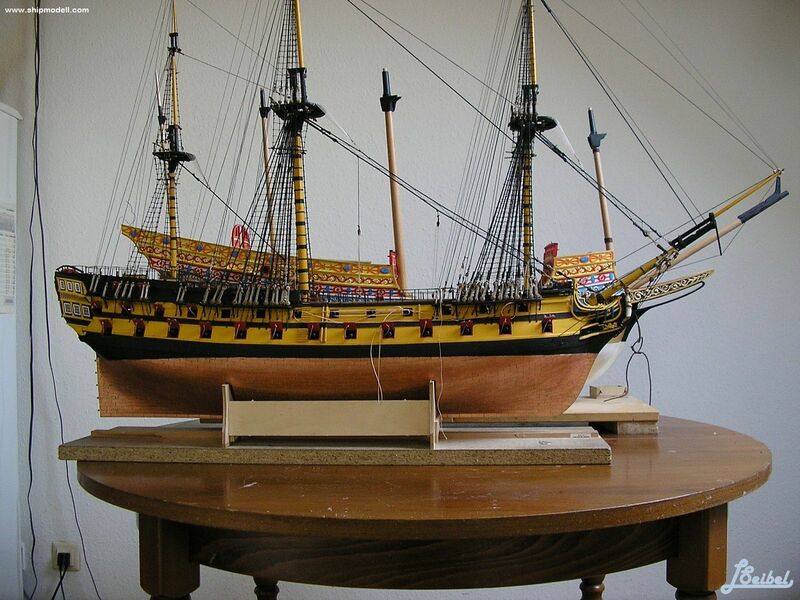 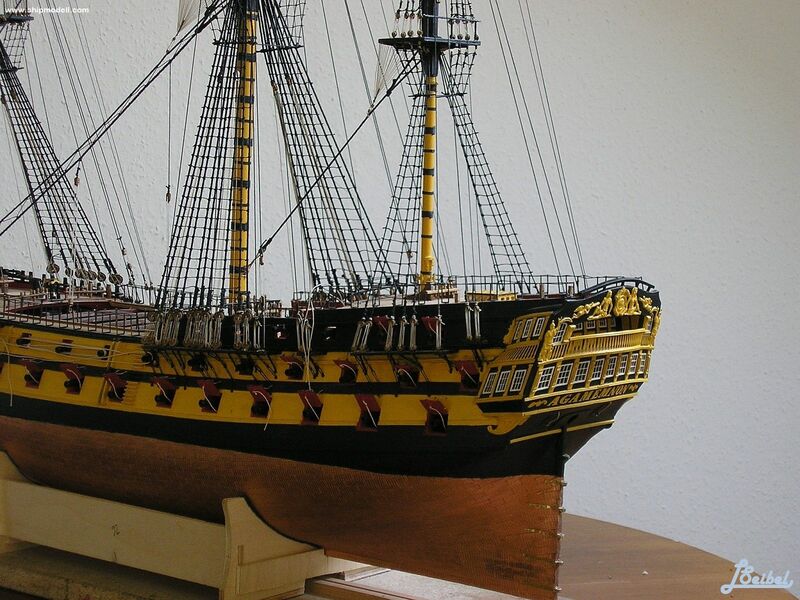 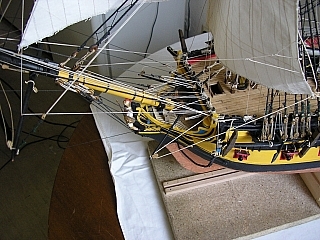 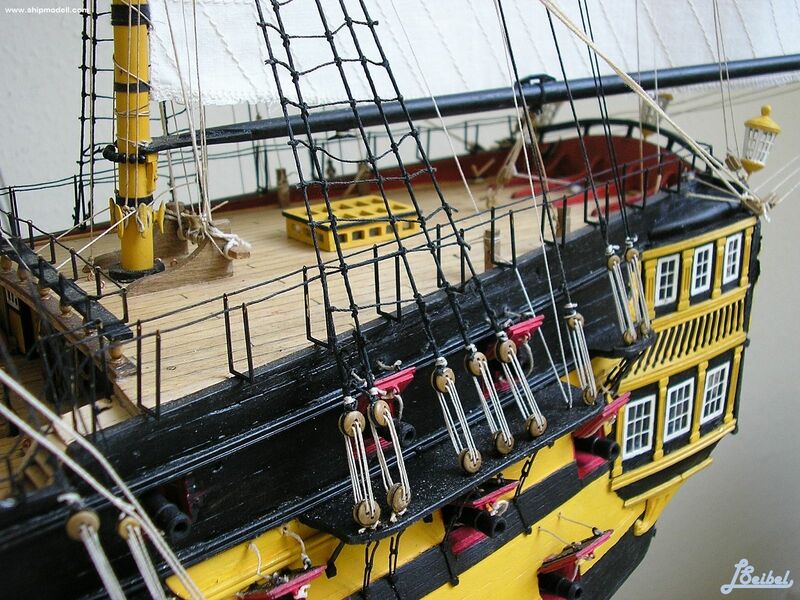 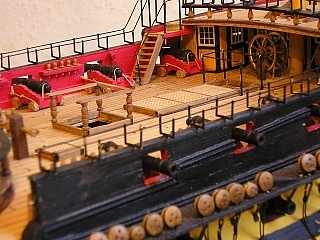 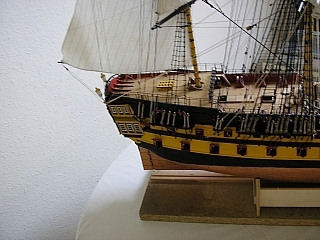 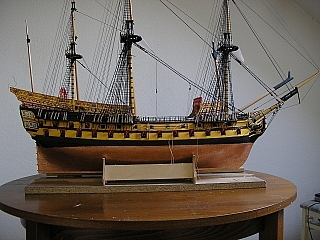 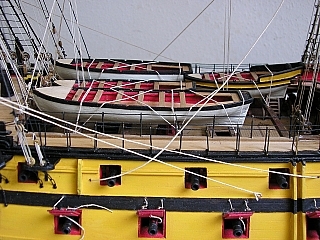 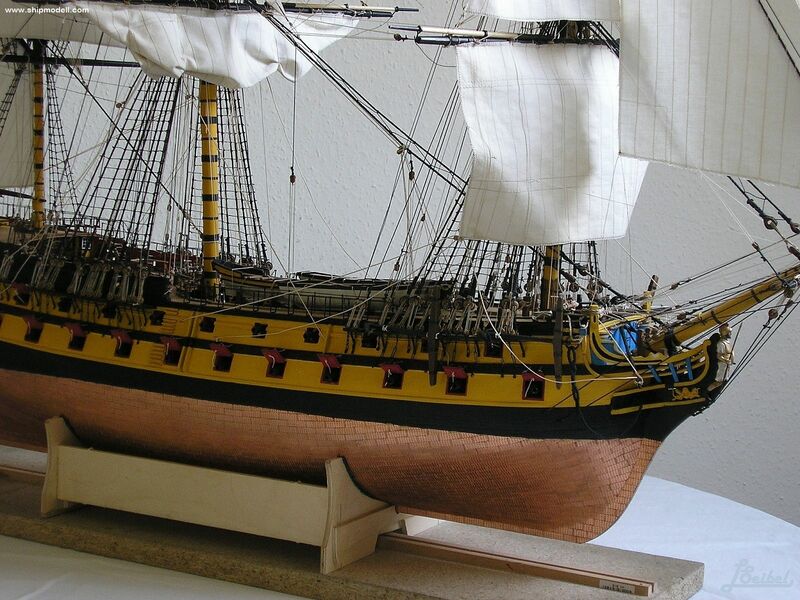 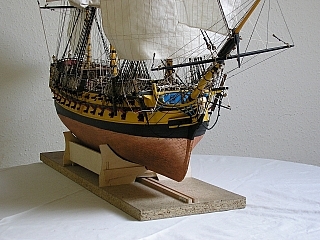 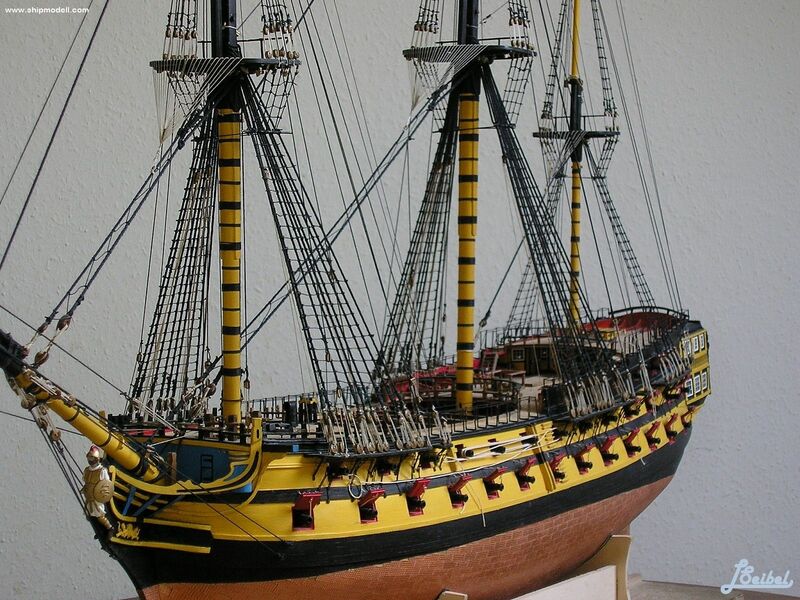 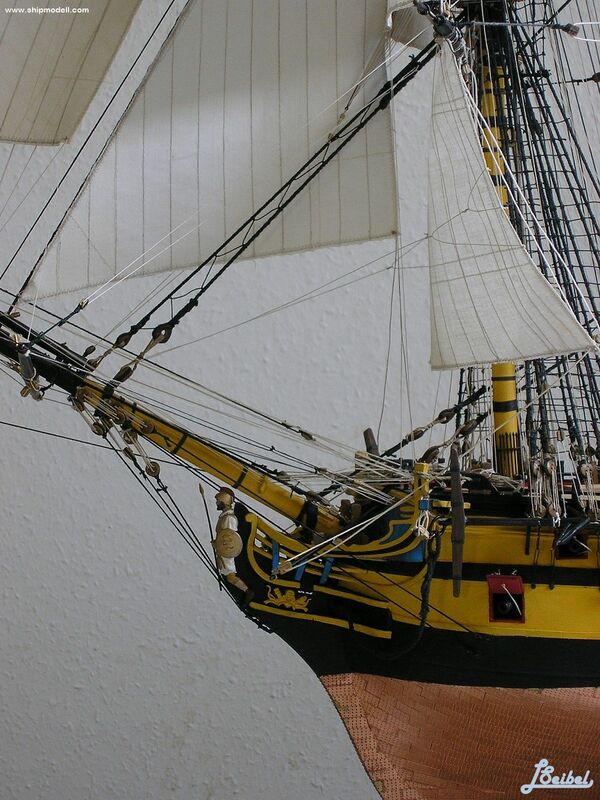 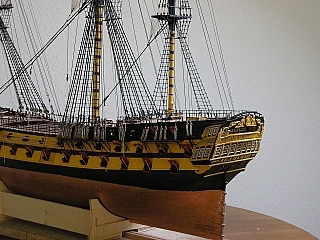 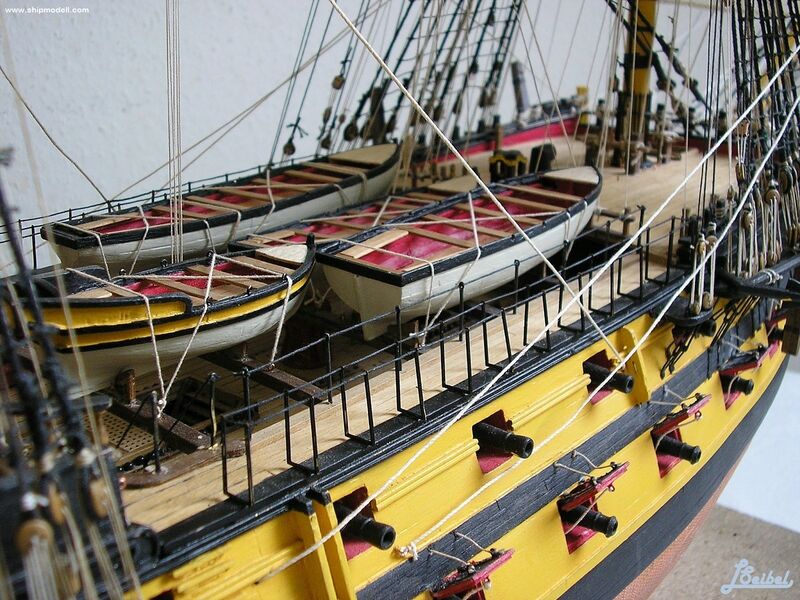 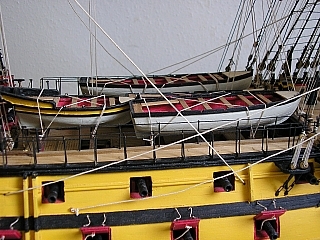 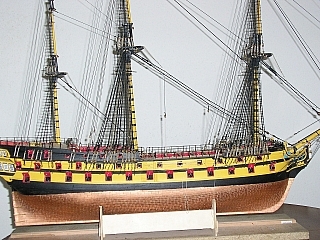 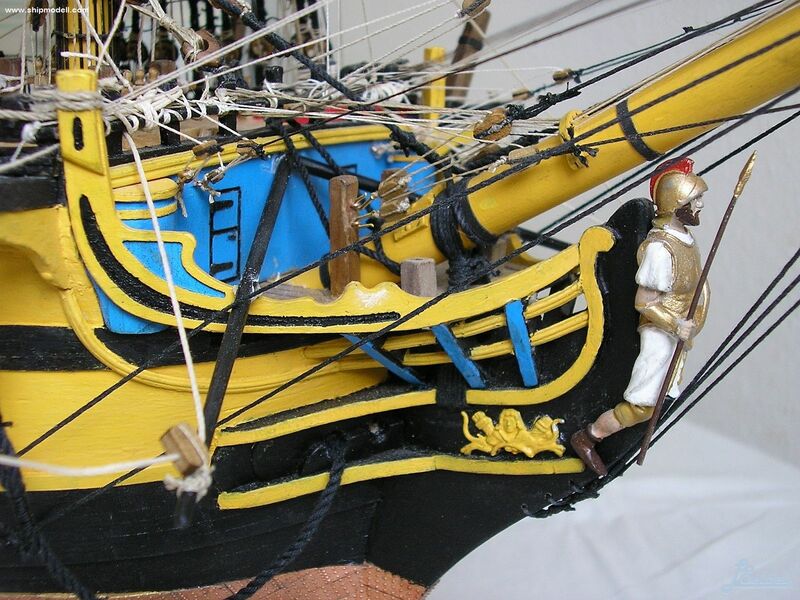 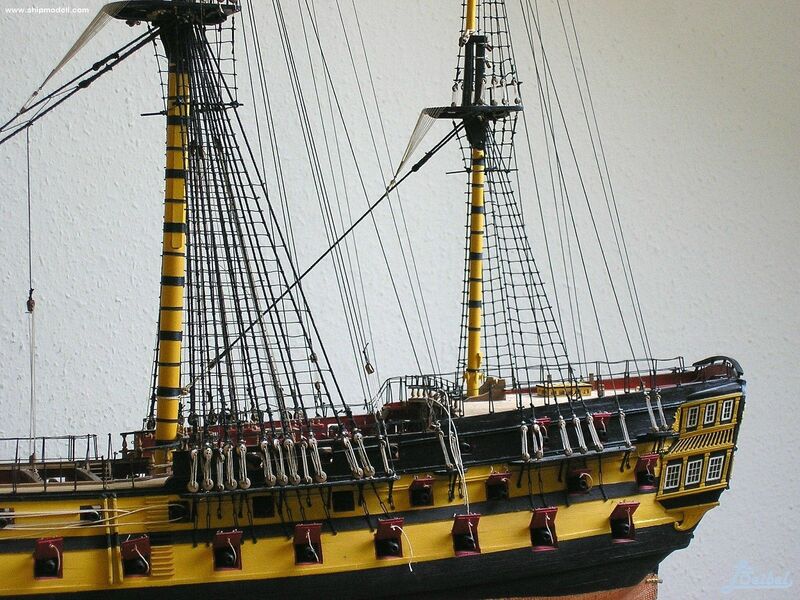 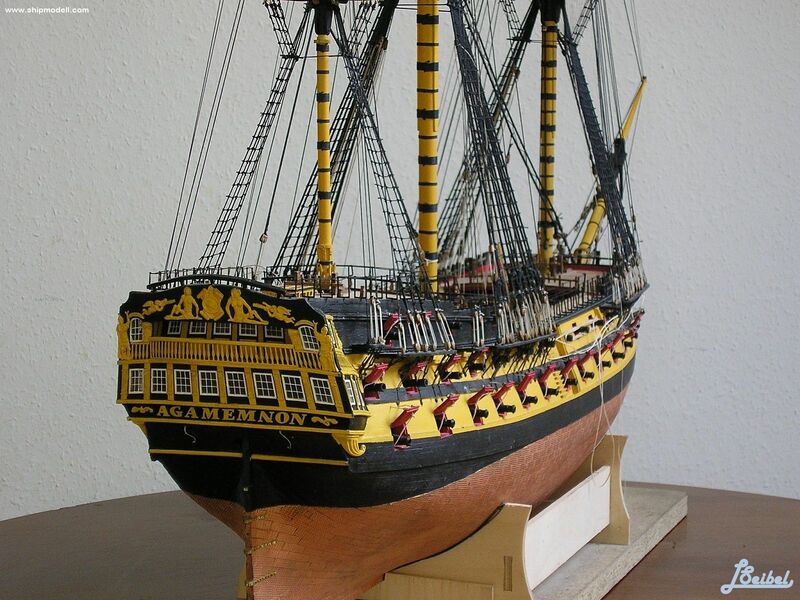 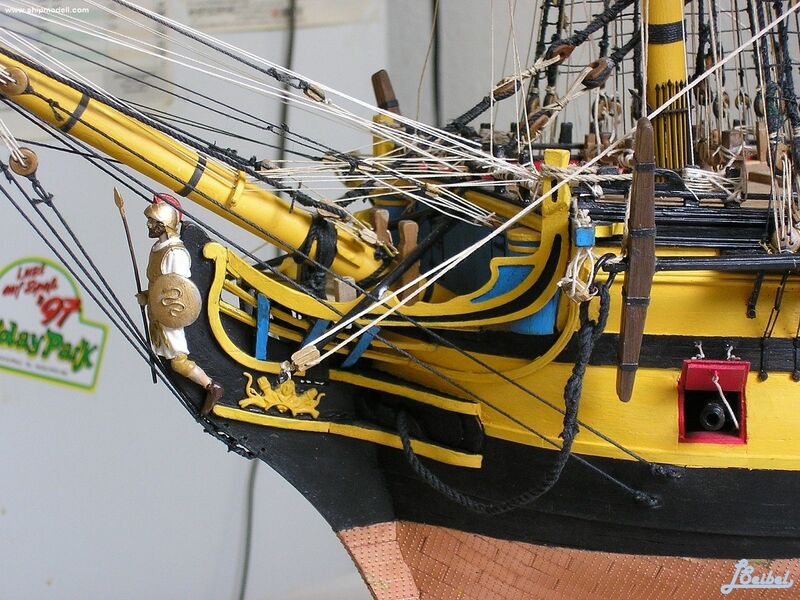 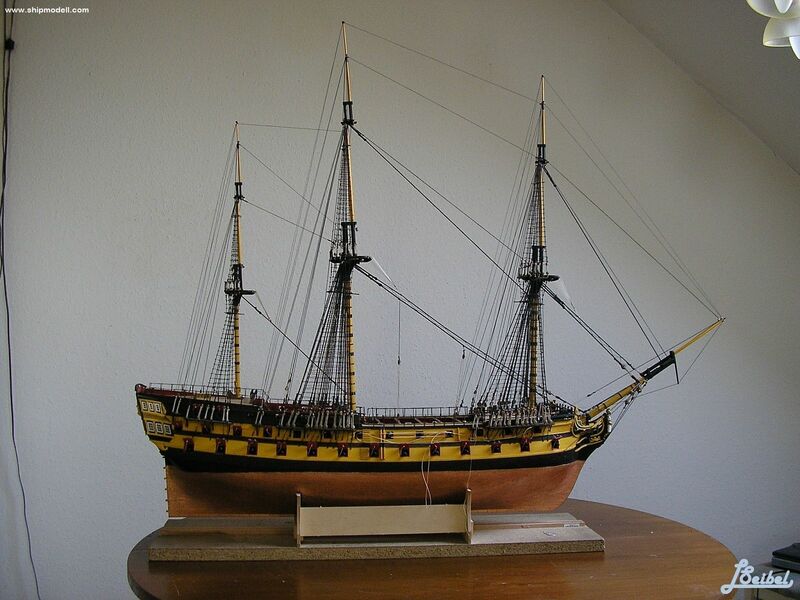 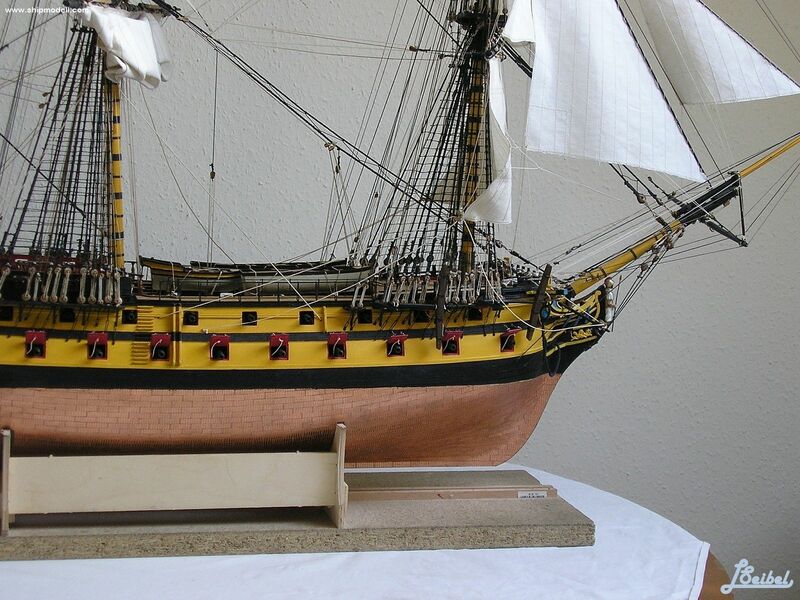 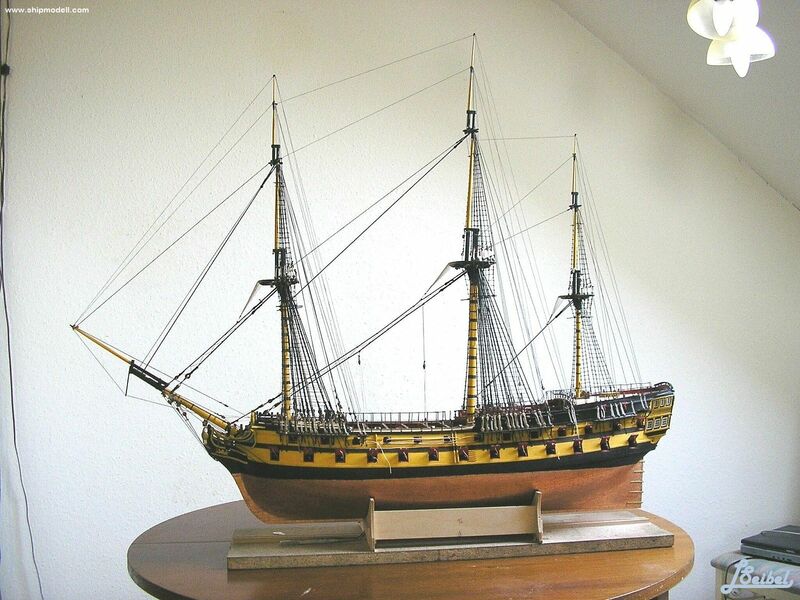 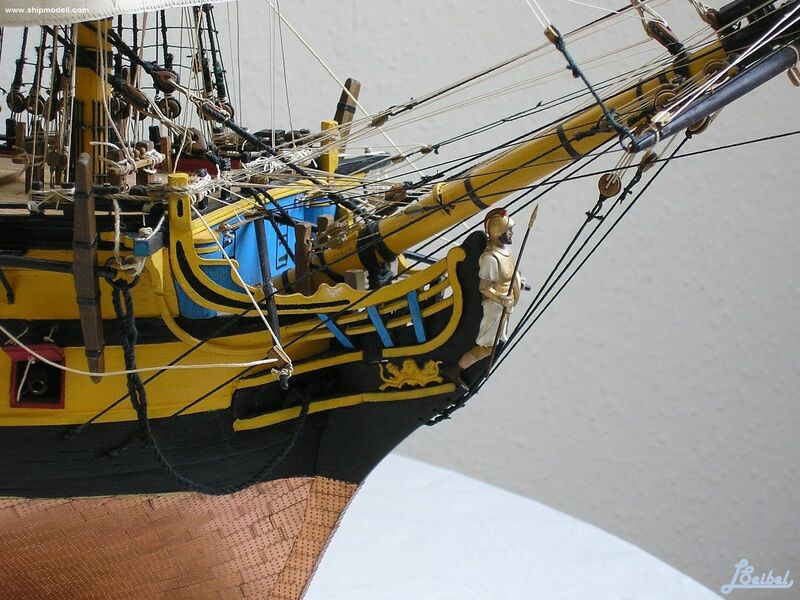 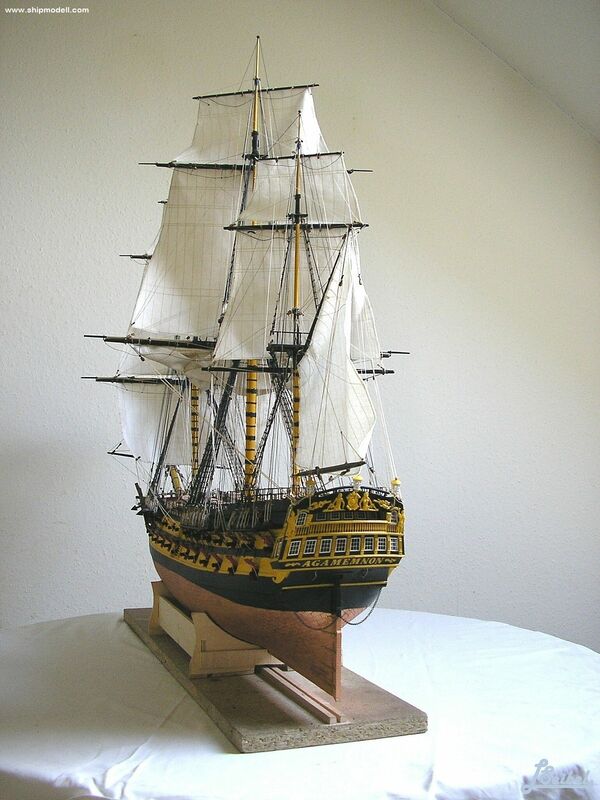 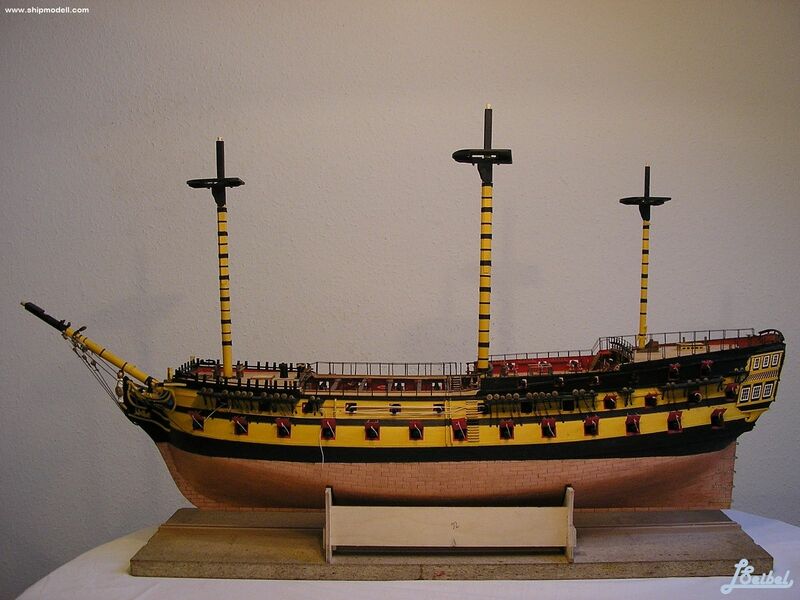 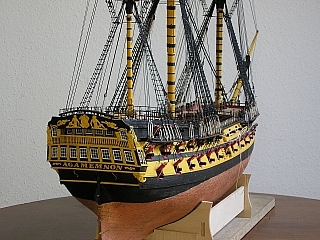 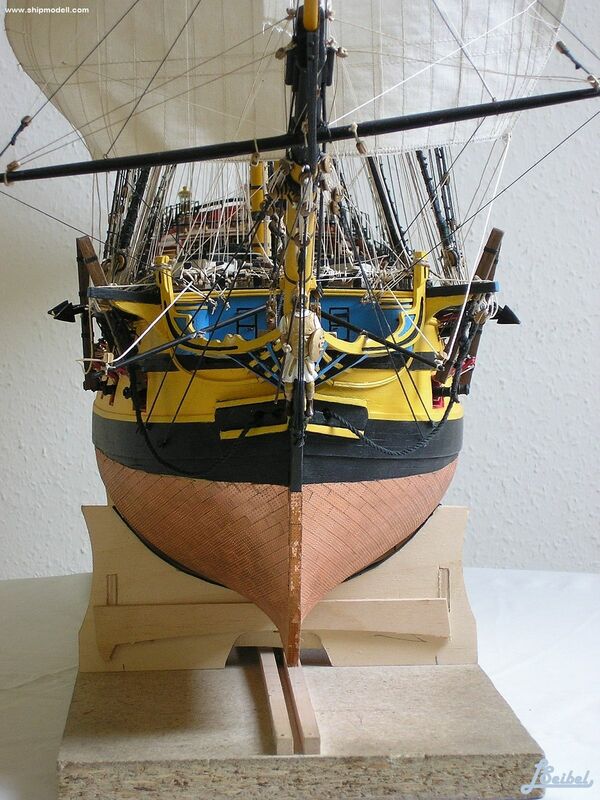 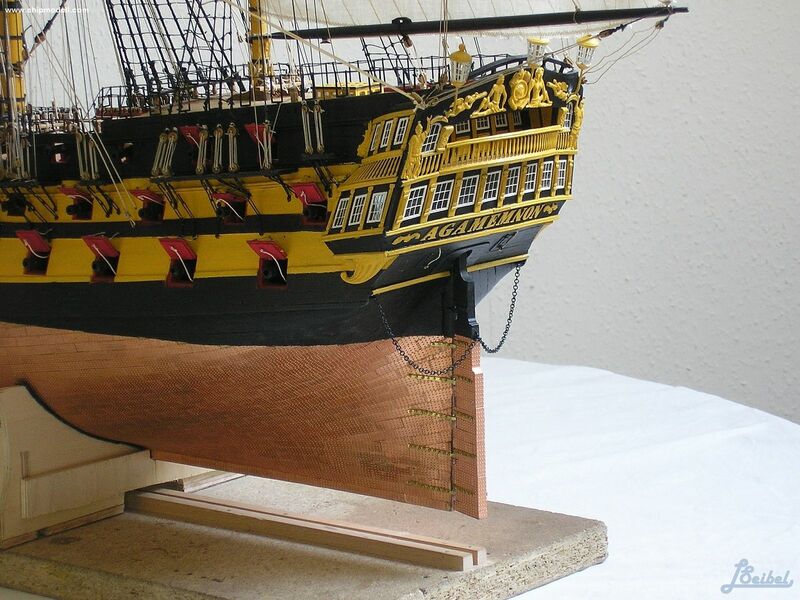 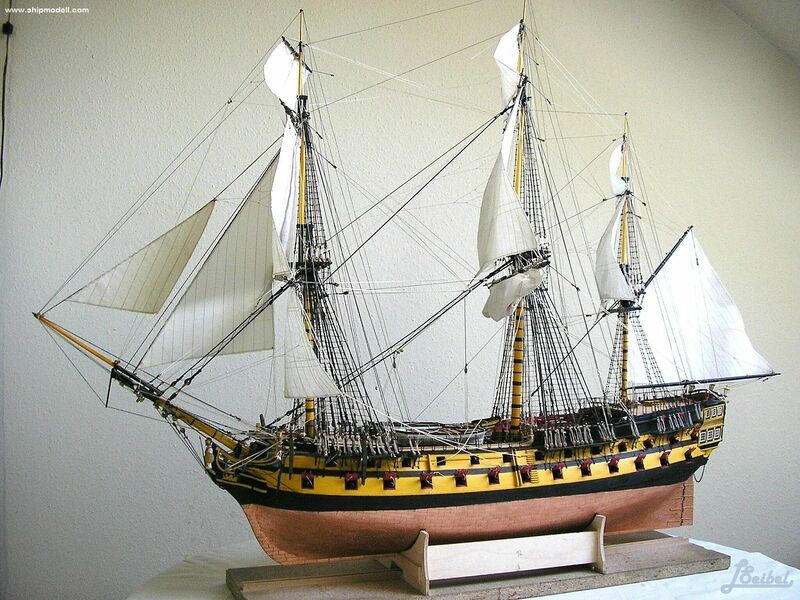 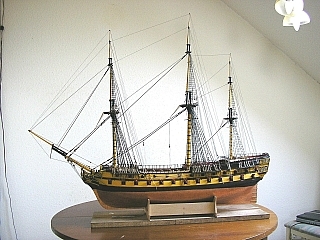 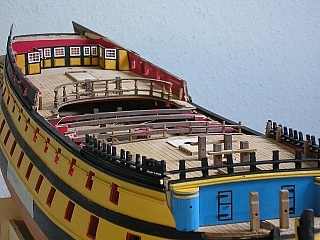 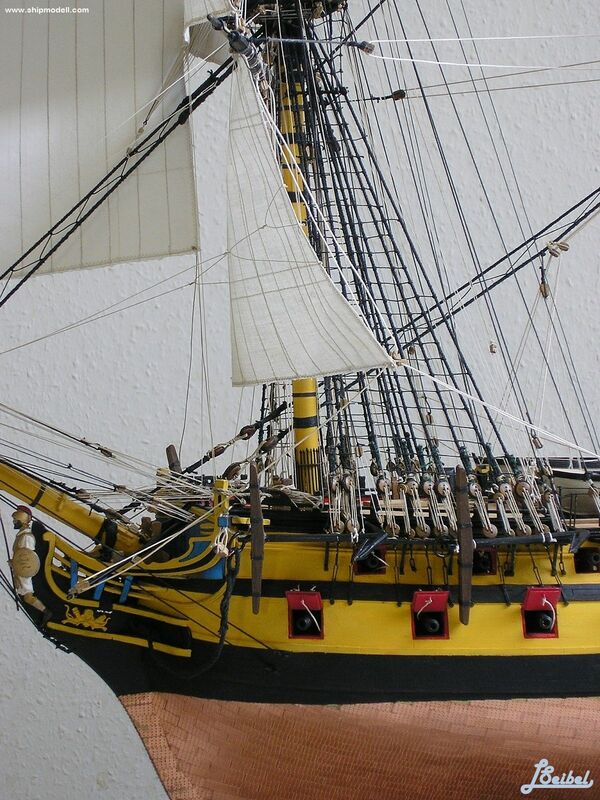 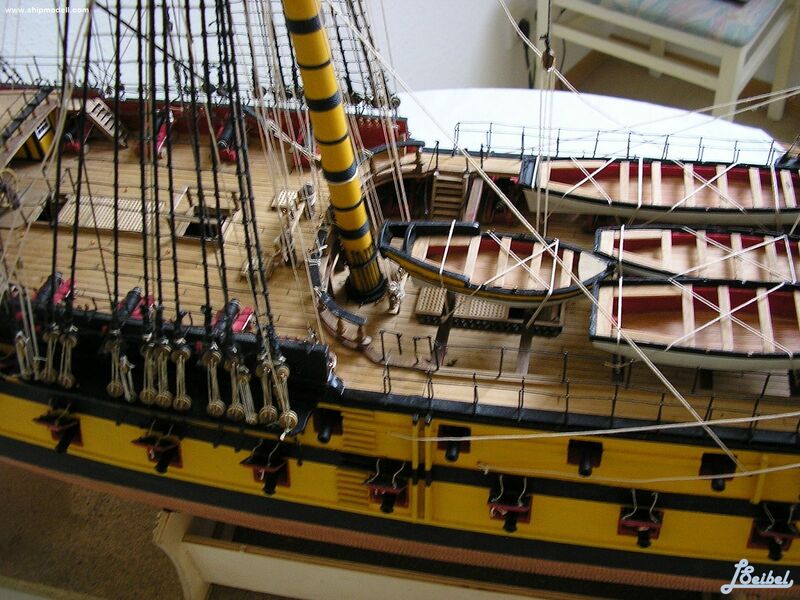 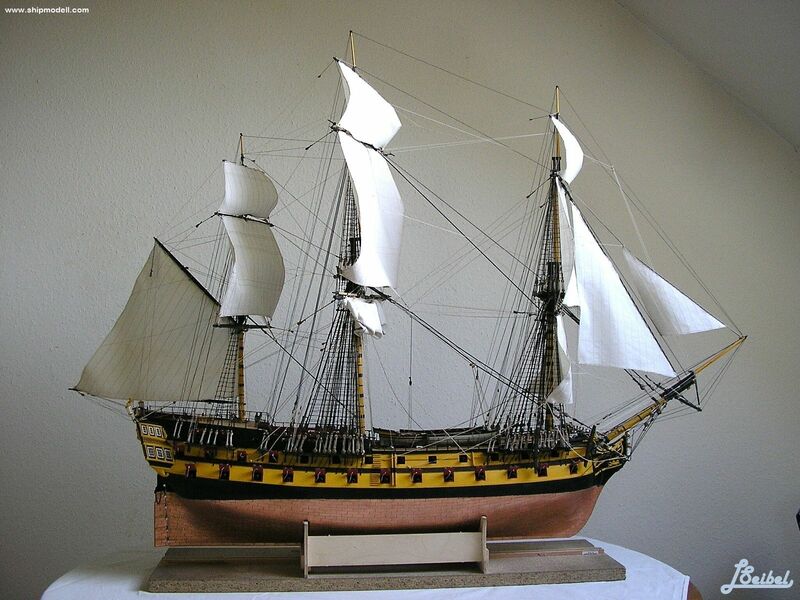 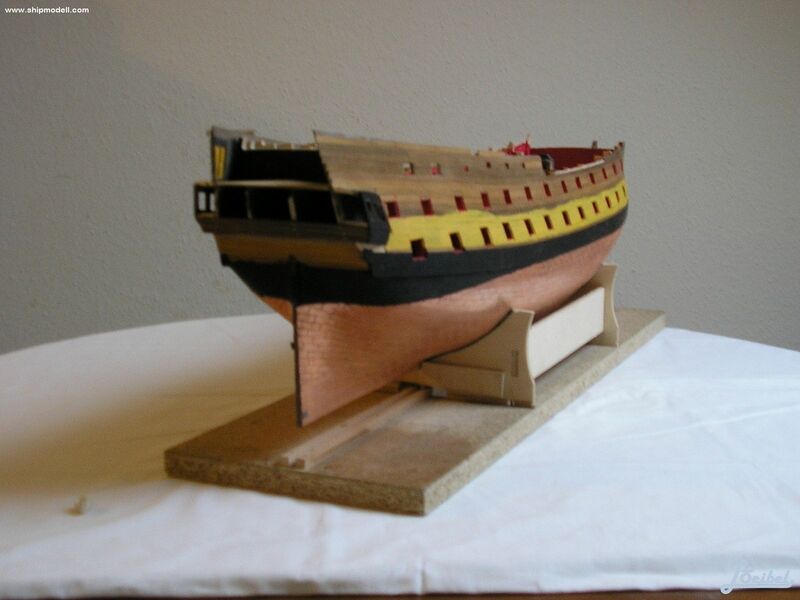 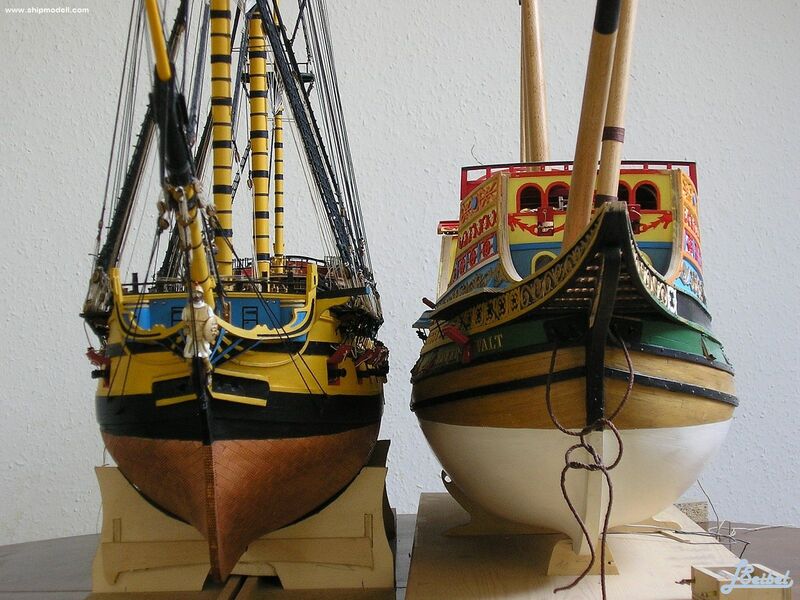 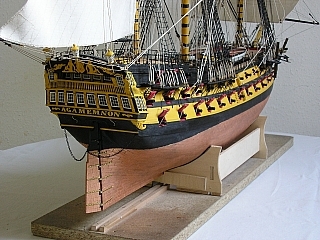 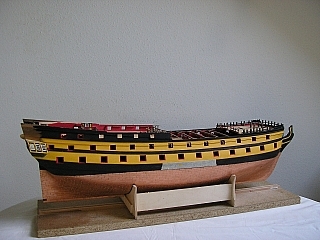 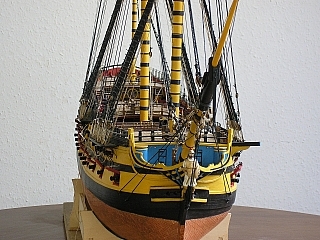 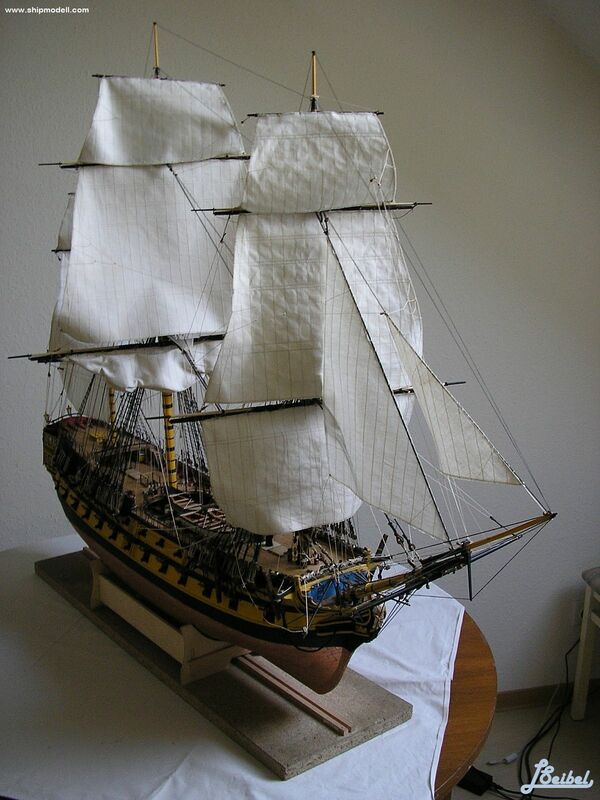 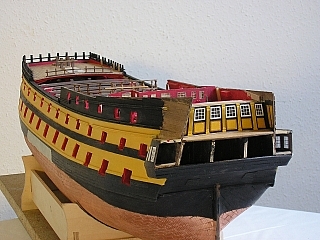 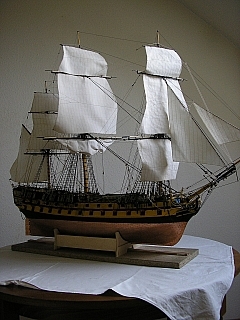 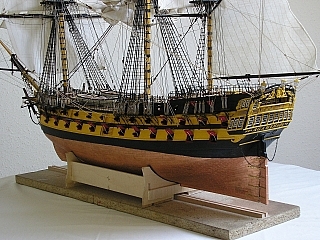 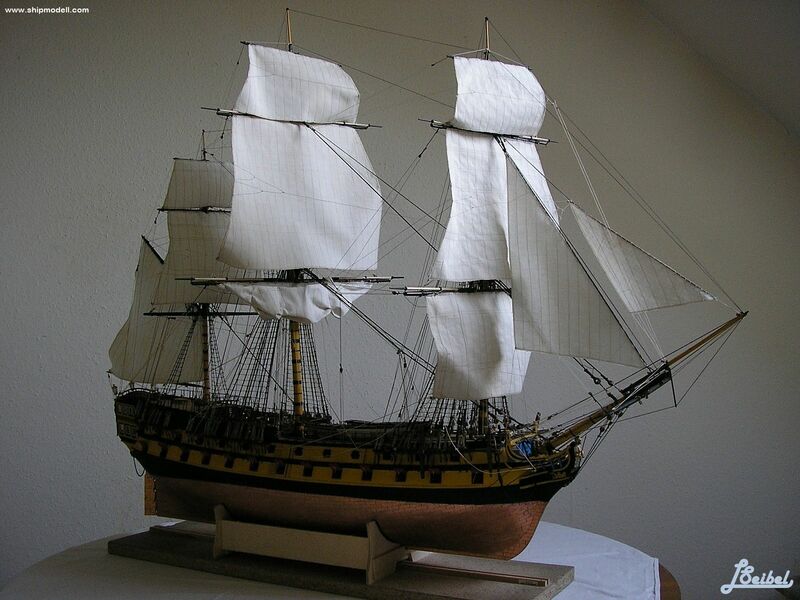 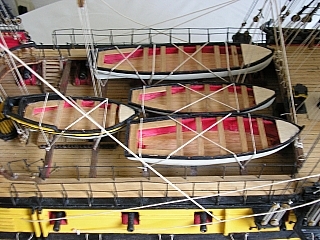 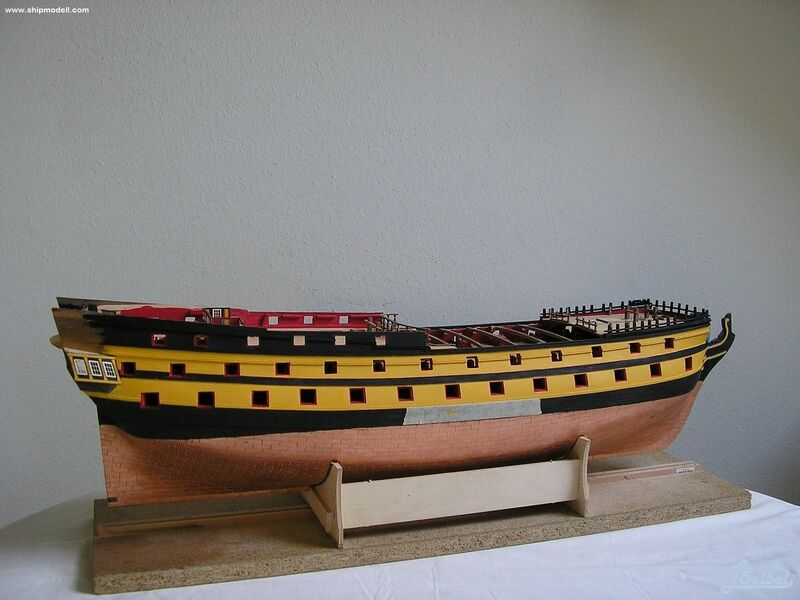 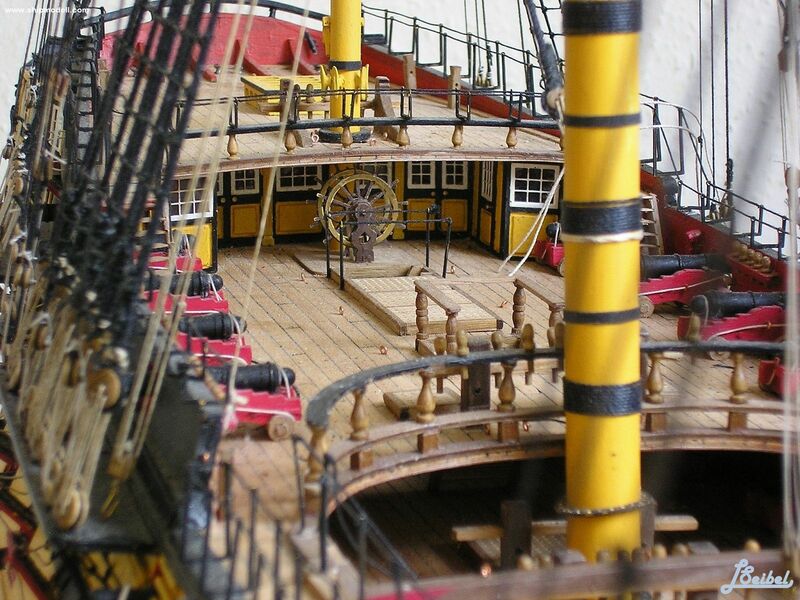 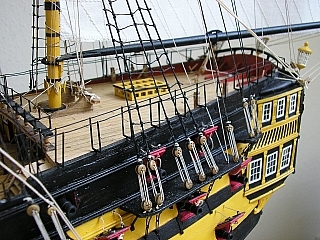 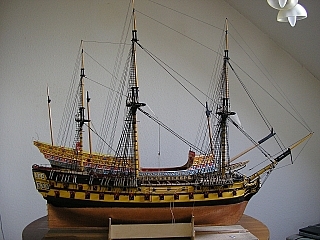 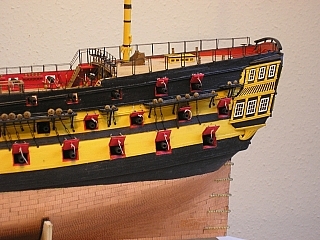 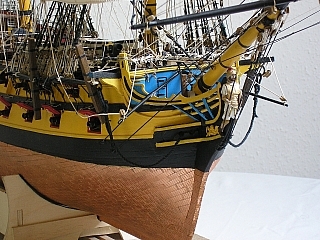 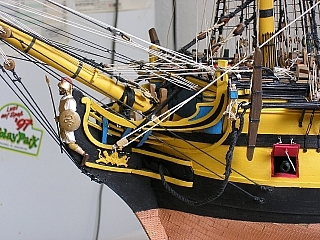 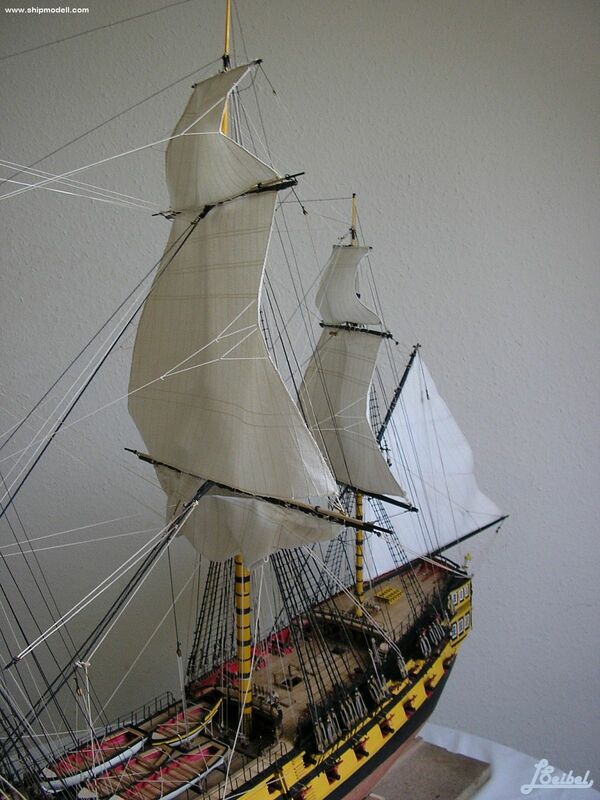 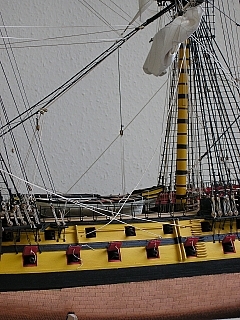 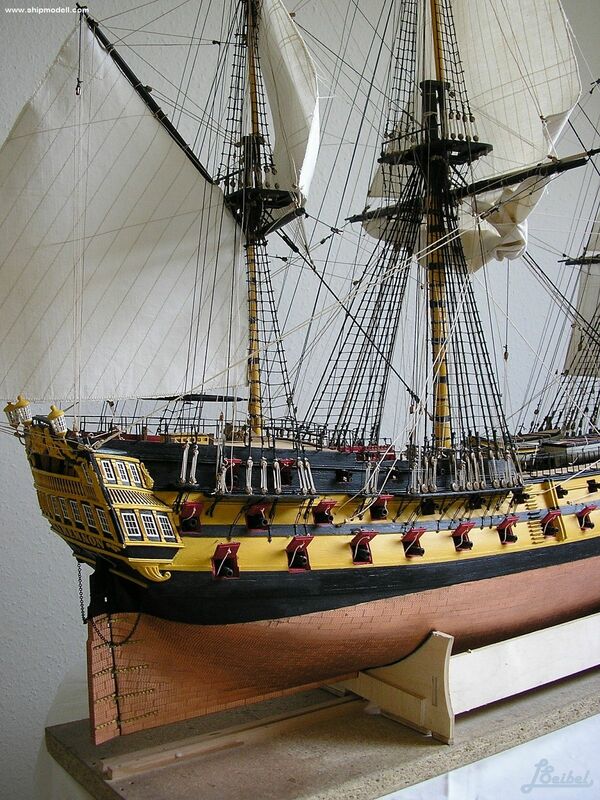 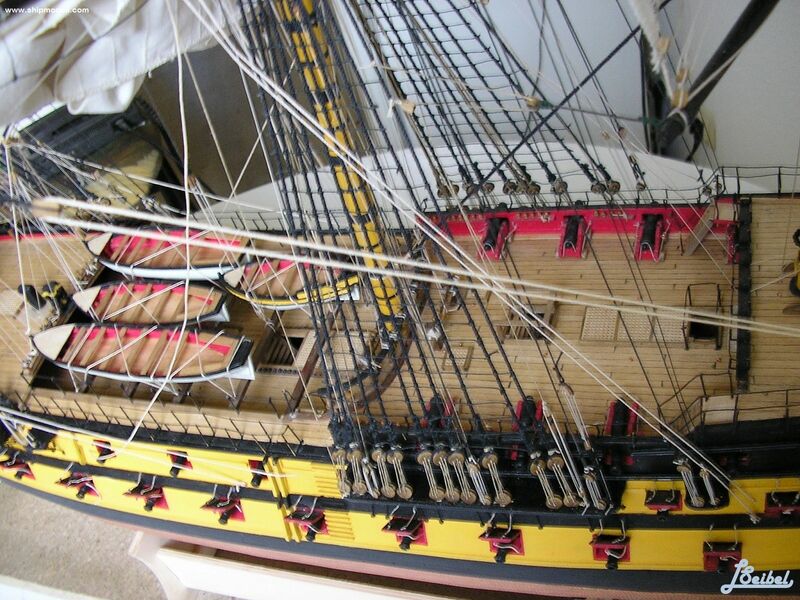 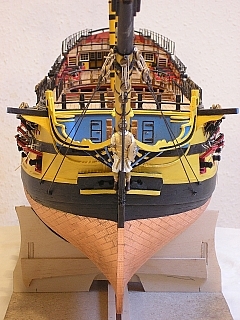 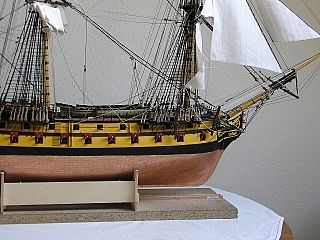 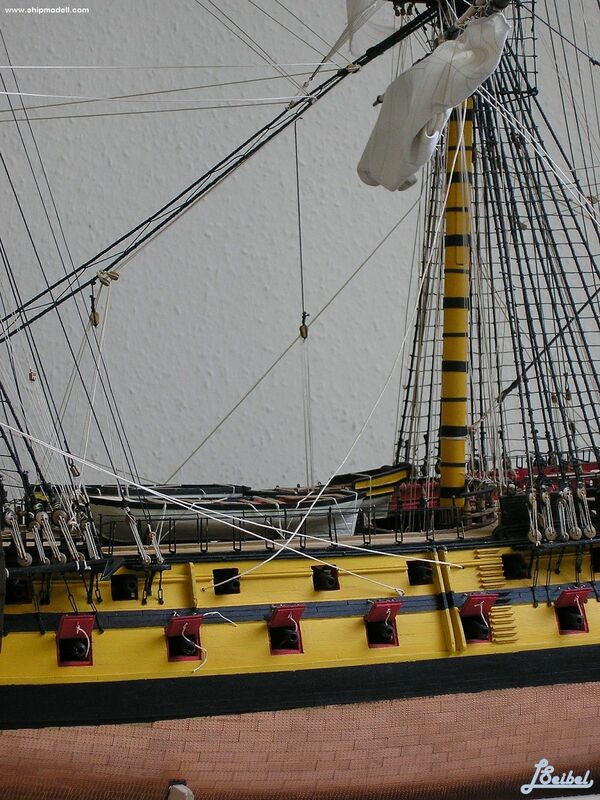 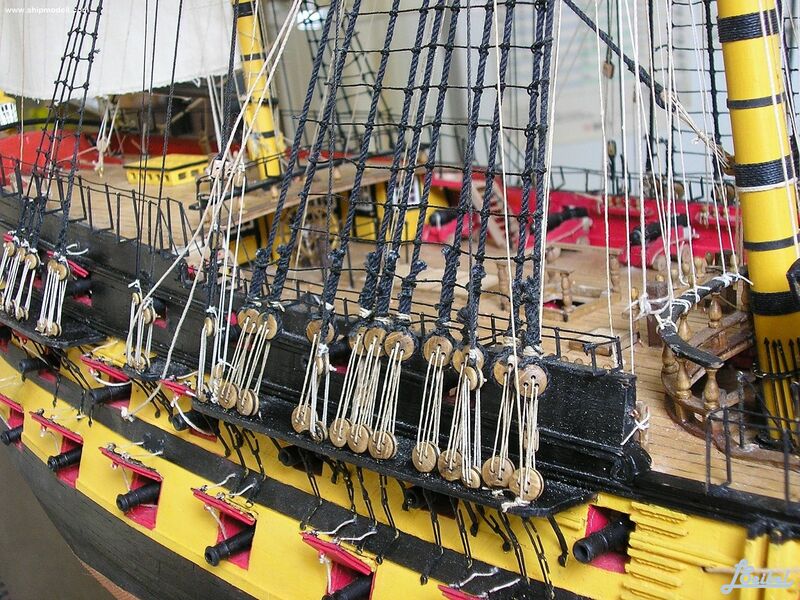 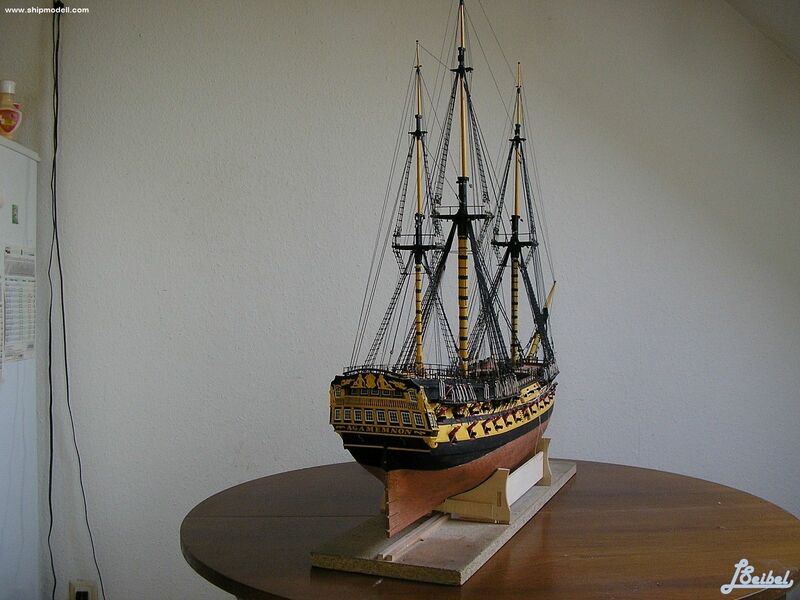 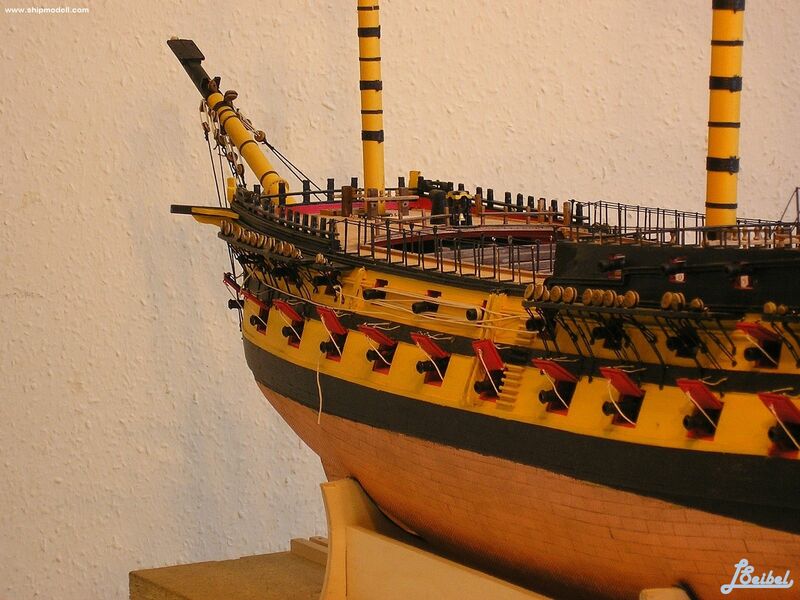 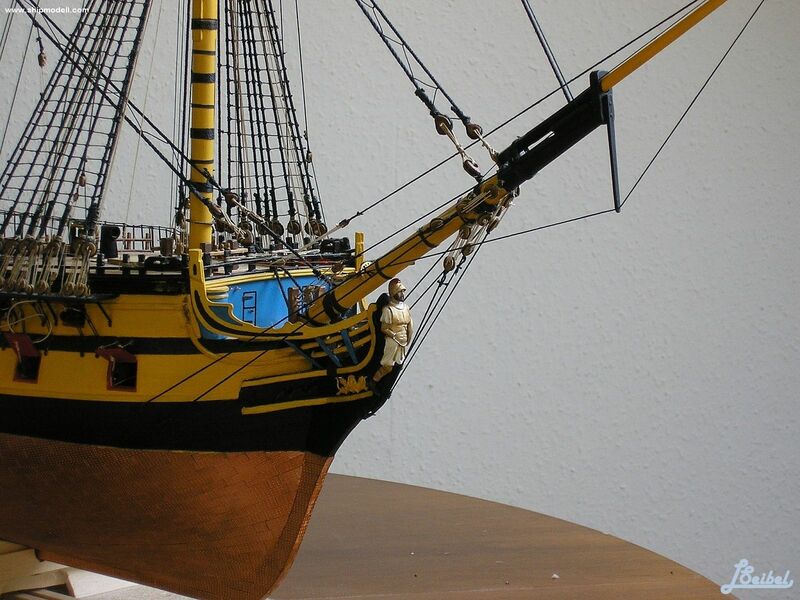 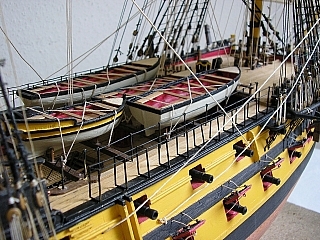 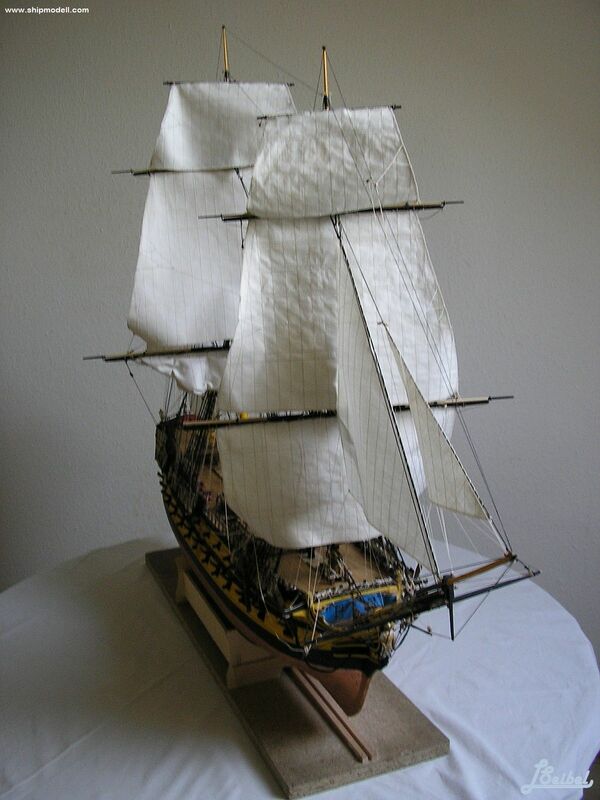 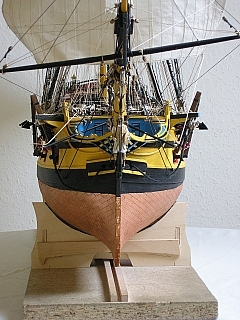 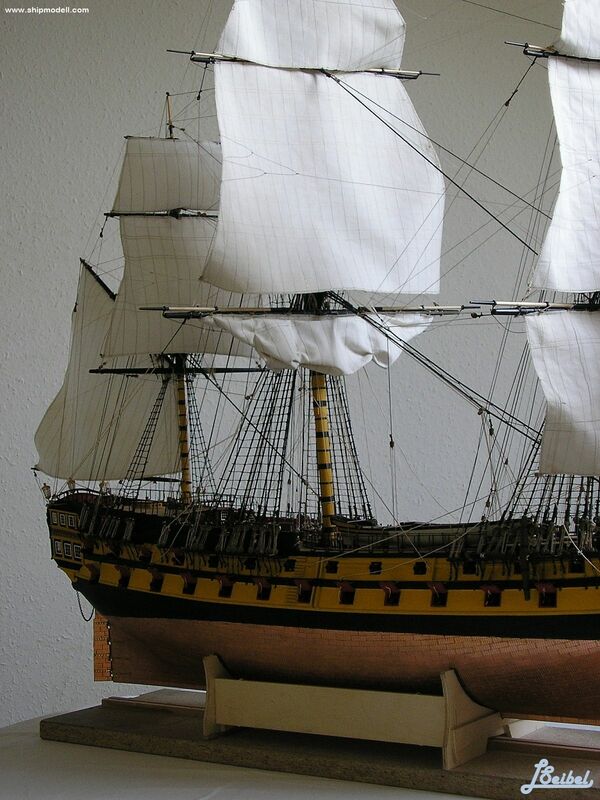 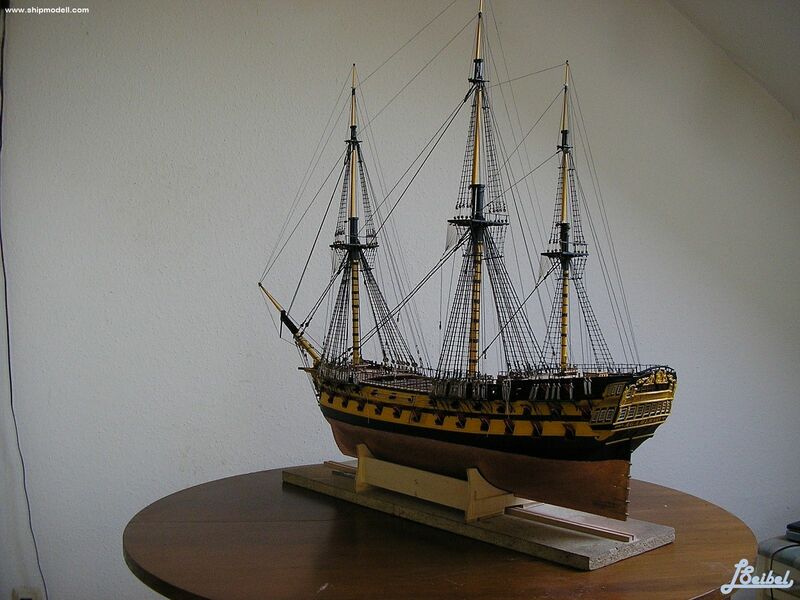 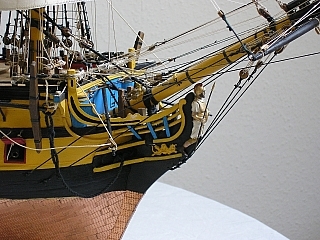 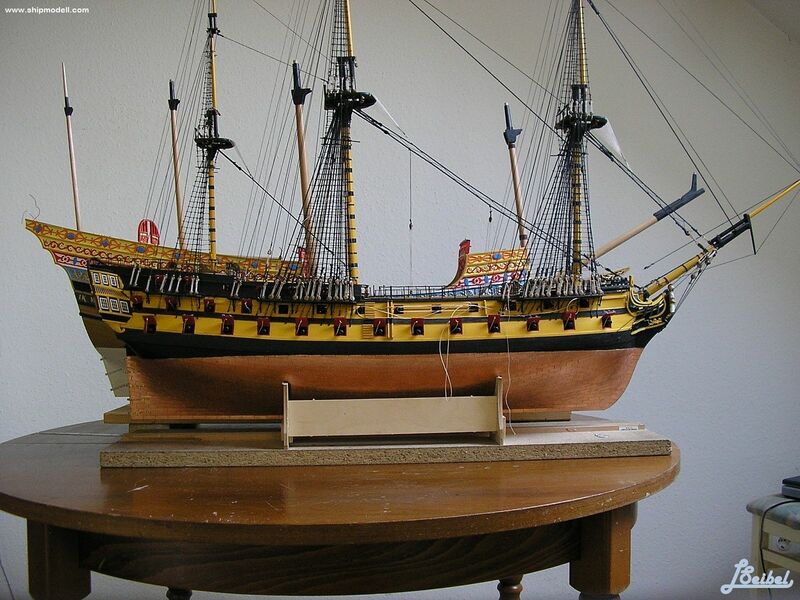 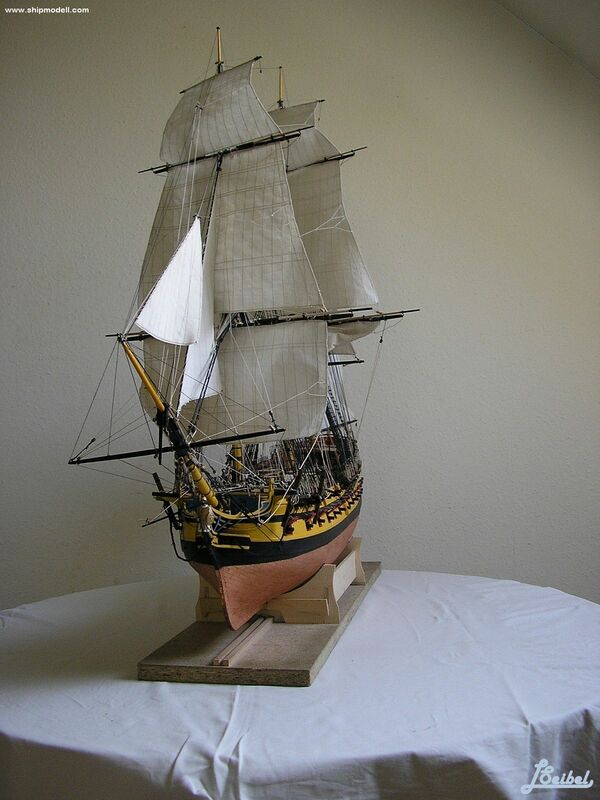 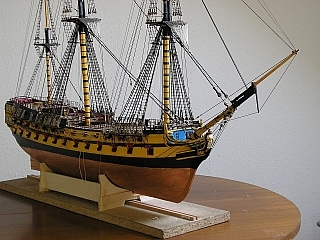 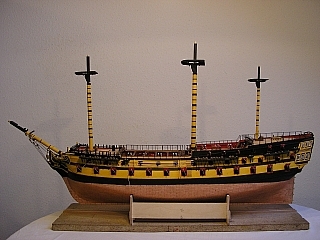 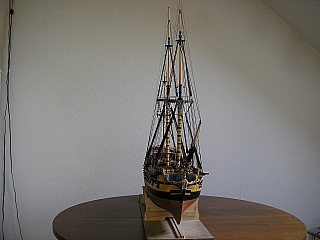 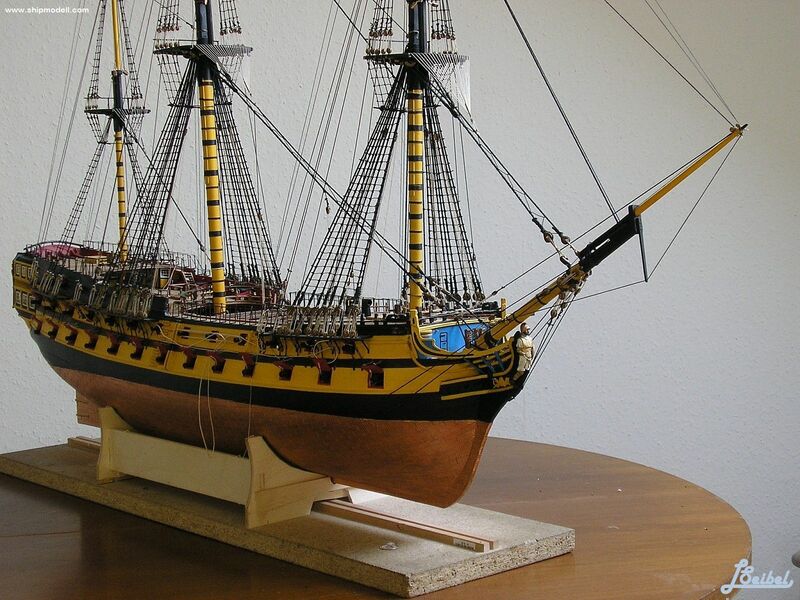 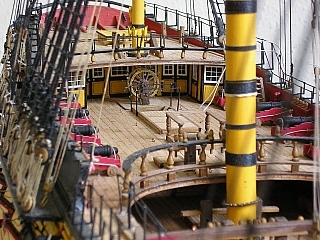 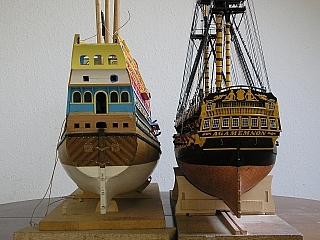 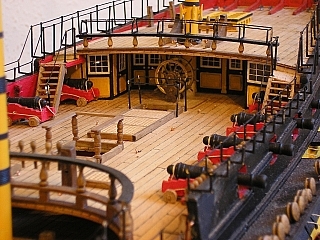 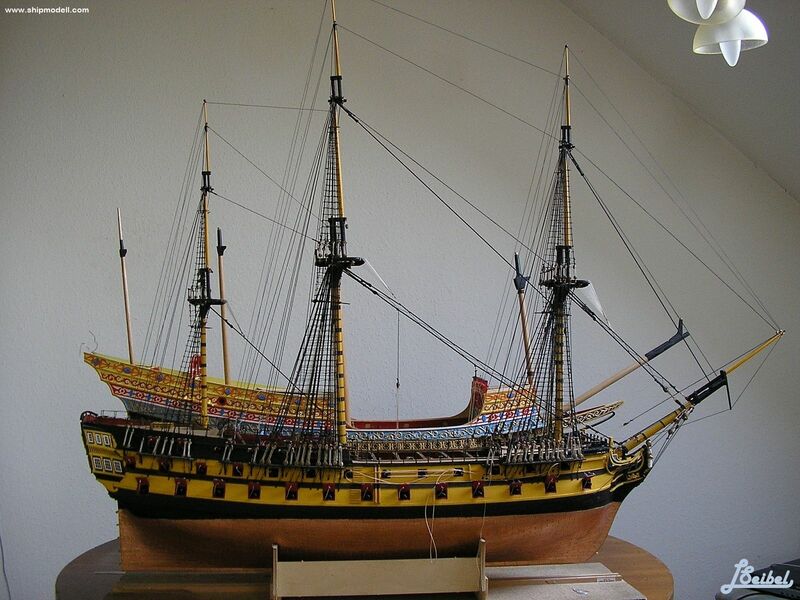 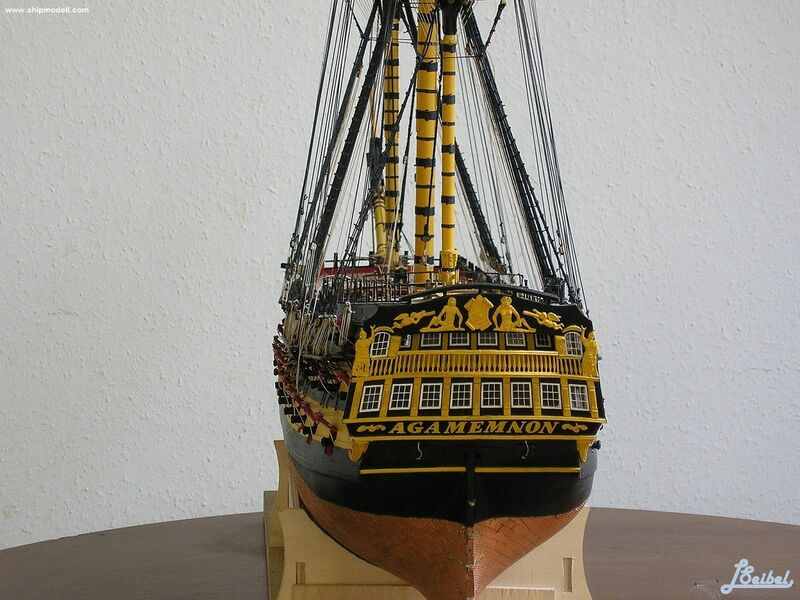 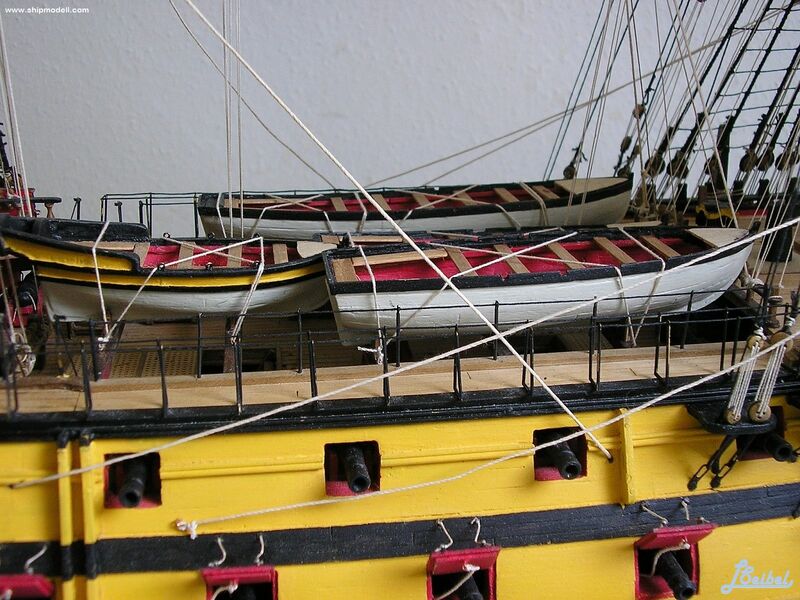 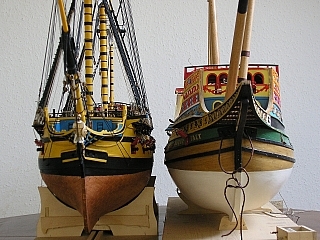 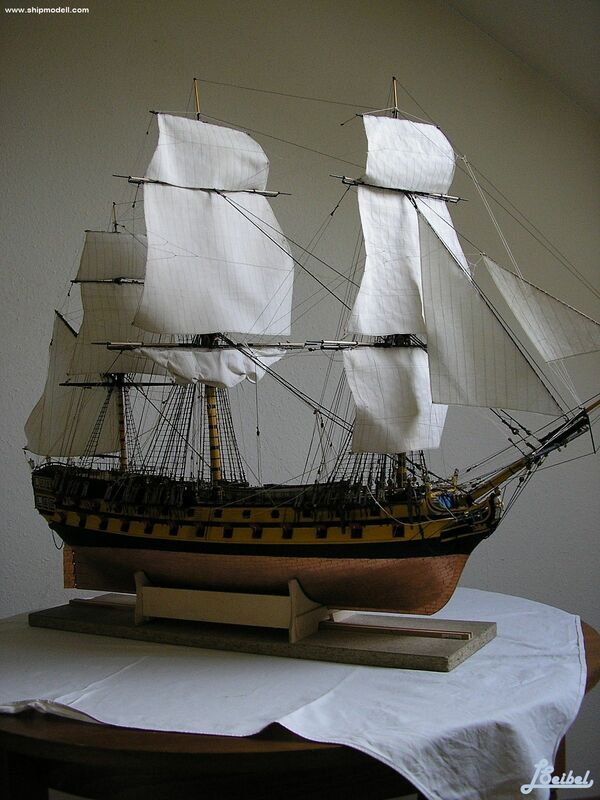 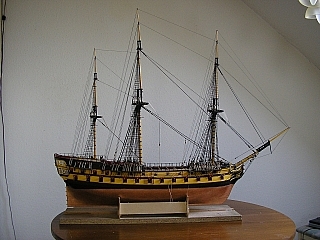 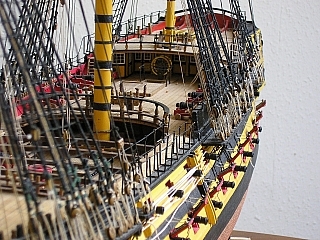 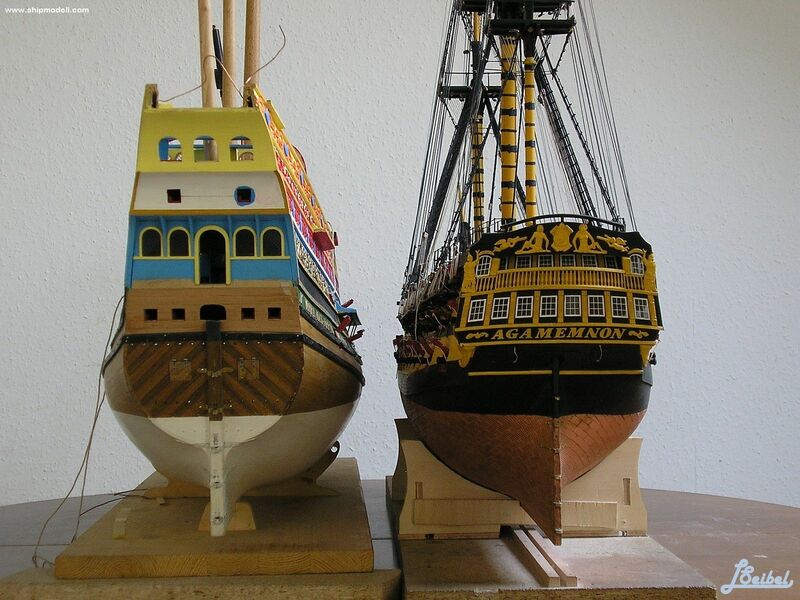 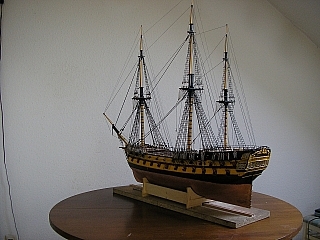 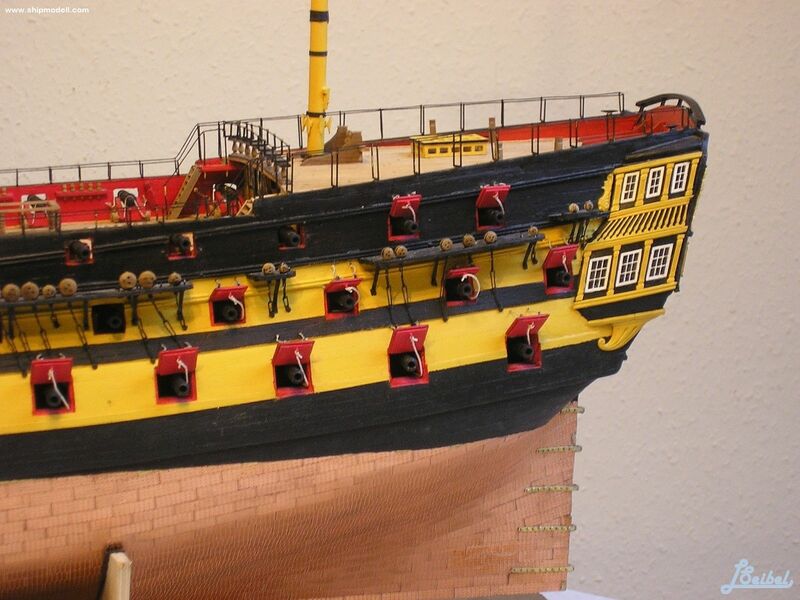 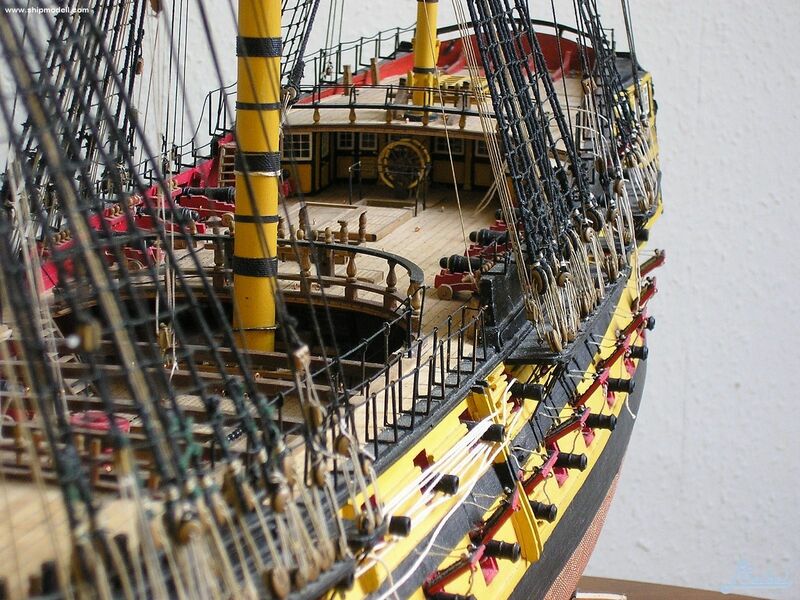 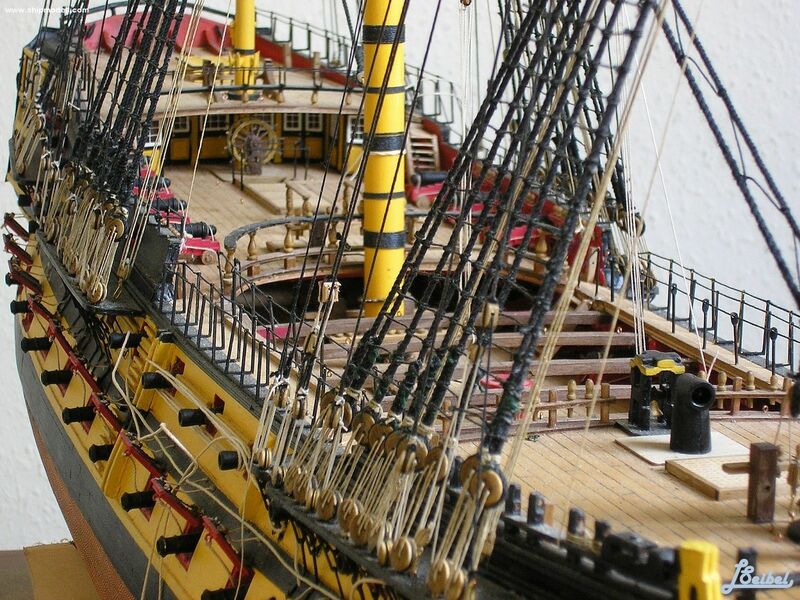 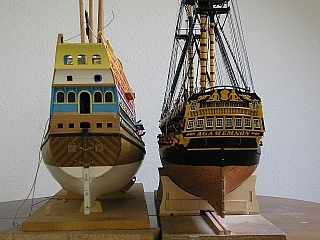 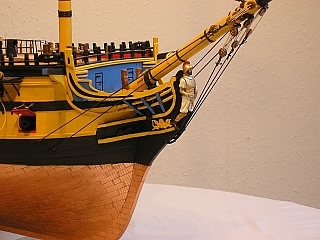 Despite Nelson's fondness for the ship, she was frequently in need of repair and refitting, and would likely have been hulked or scrapped in 1802 had war with France not recommenced. 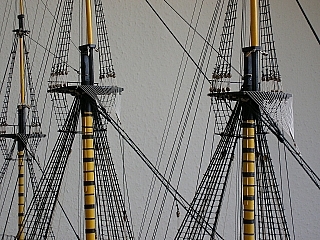 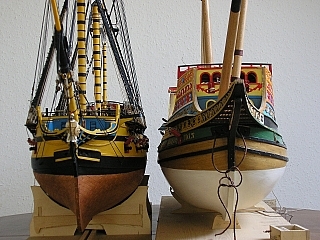 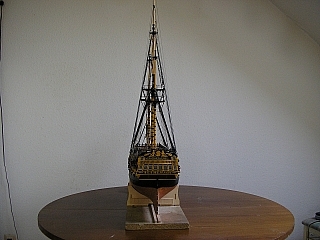 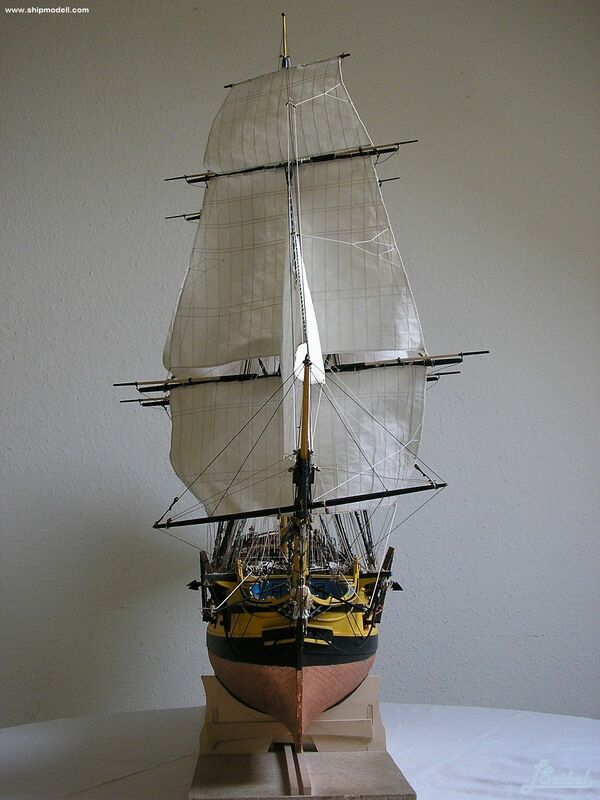 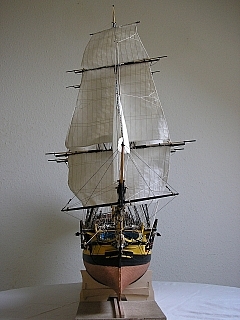 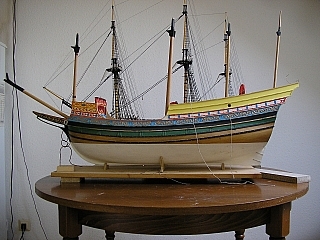 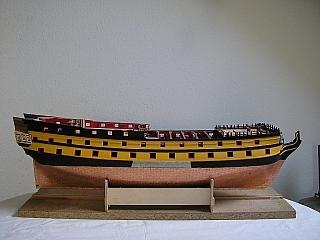 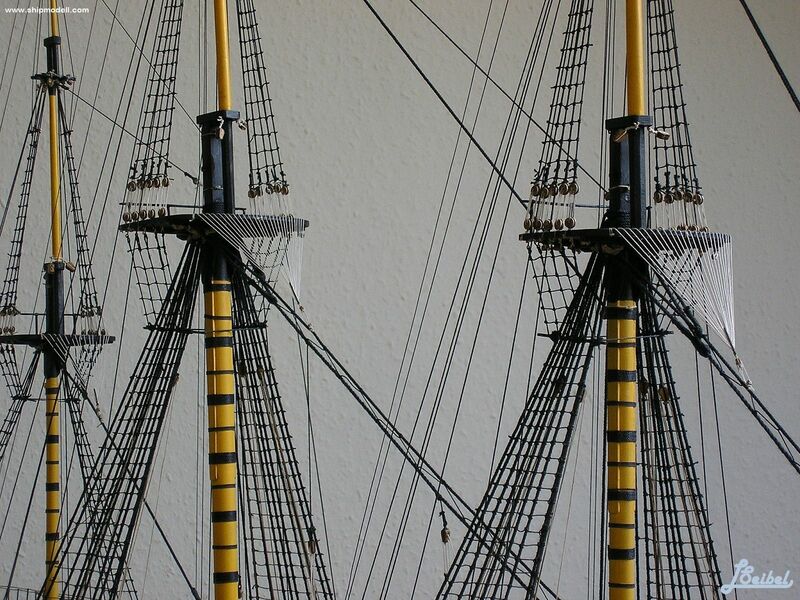 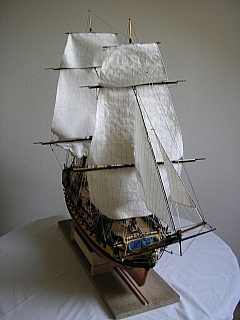 She fought at the Battle of Trafalgar on 21 October 1805, as part of Nelson's weather column, where she forced the surrender of the Spanish four-decker Santísima Trinidad. Agamemnon's later career was served in South American waters off Brazil. 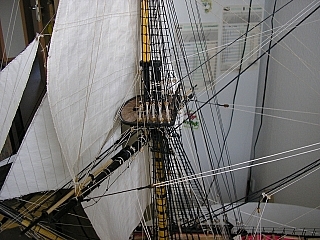 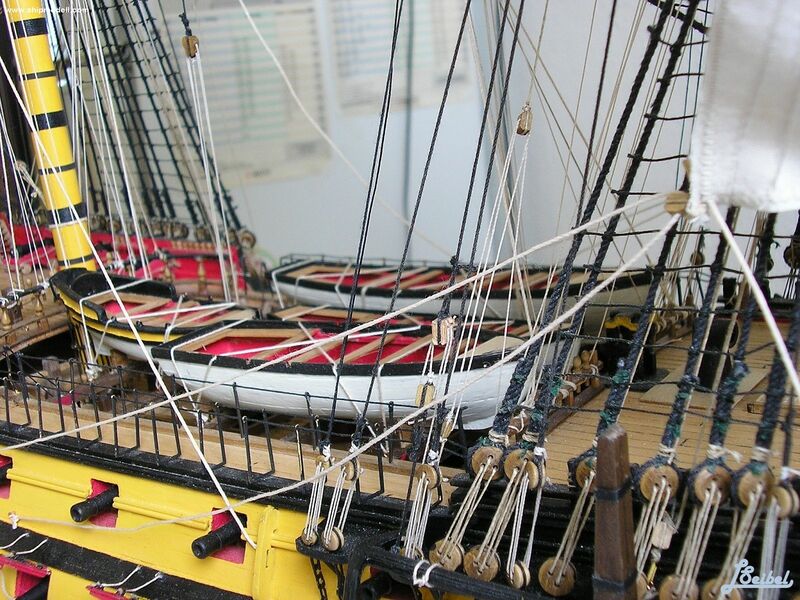 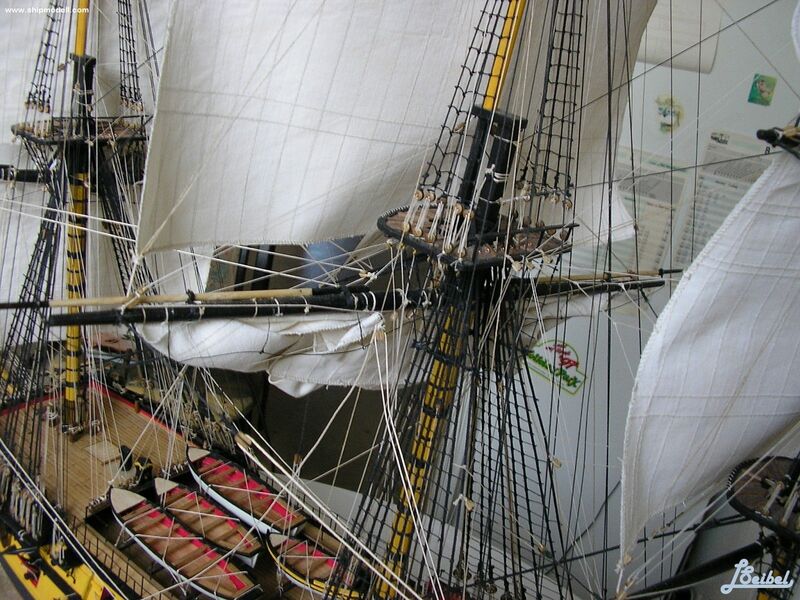 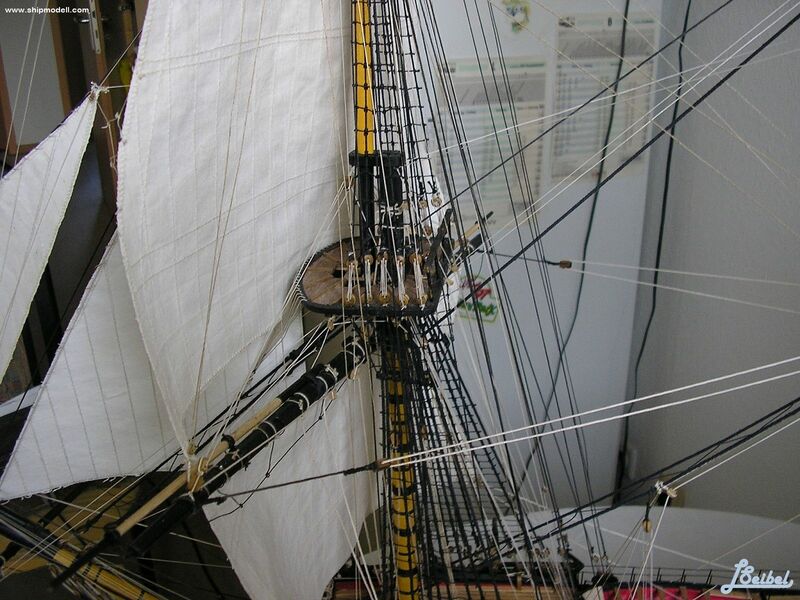 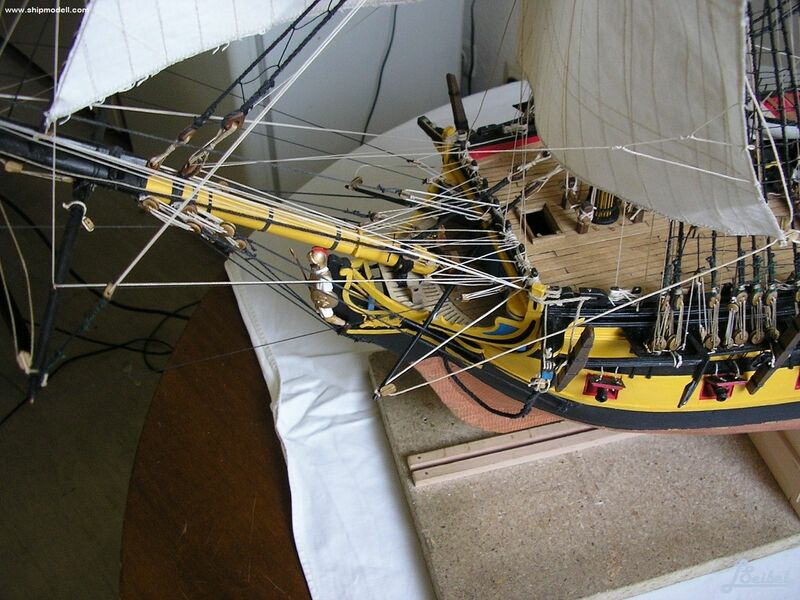 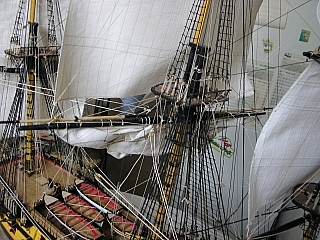 Her oft worn-out and poor condition contributed to her being wrecked when in June 1809 she grounded on an uncharted shoal in the mouth of the River Plate, whilst seeking shelter with the rest of her squadron from a storm. 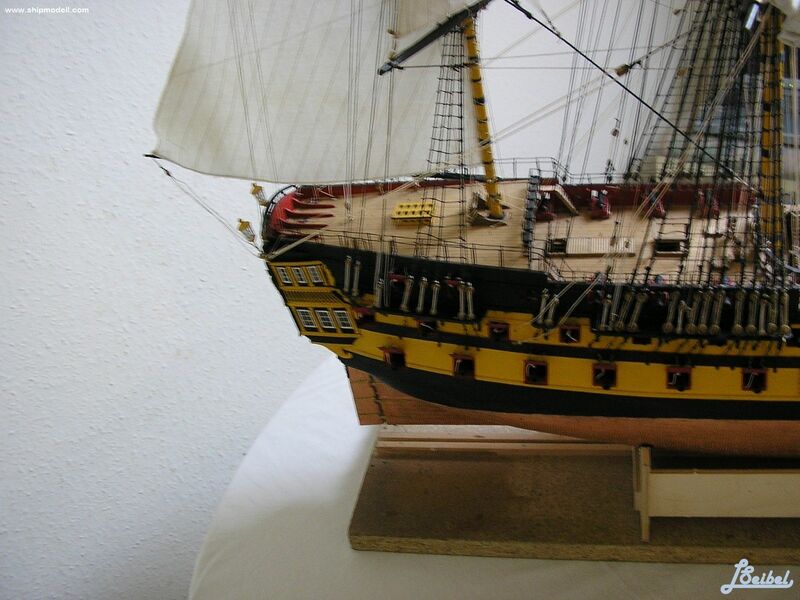 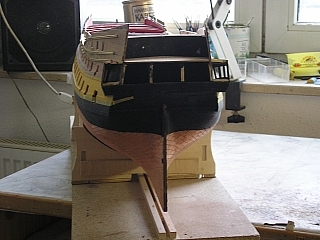 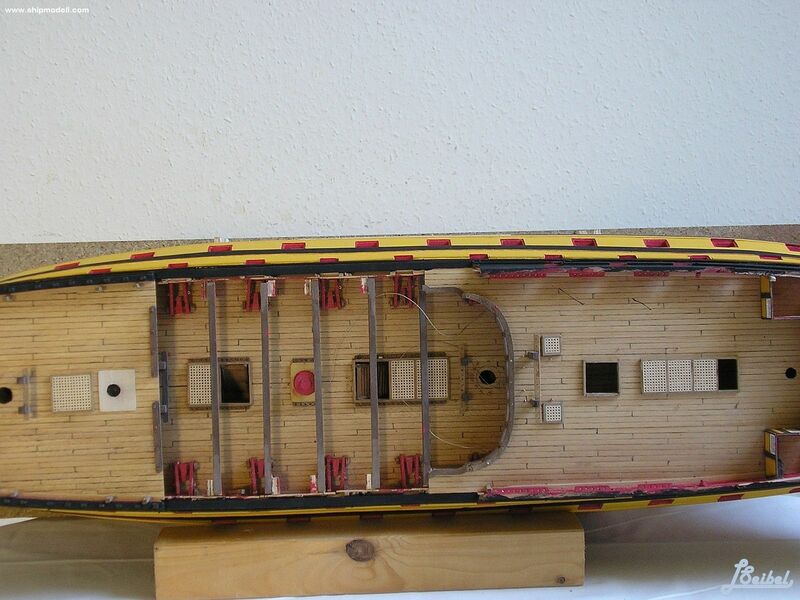 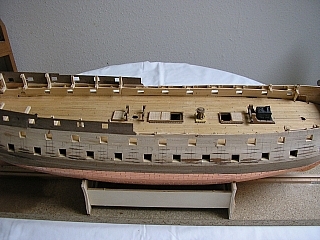 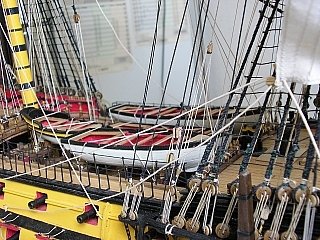 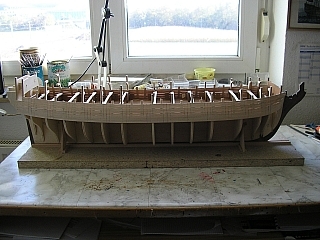 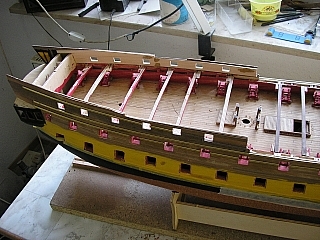 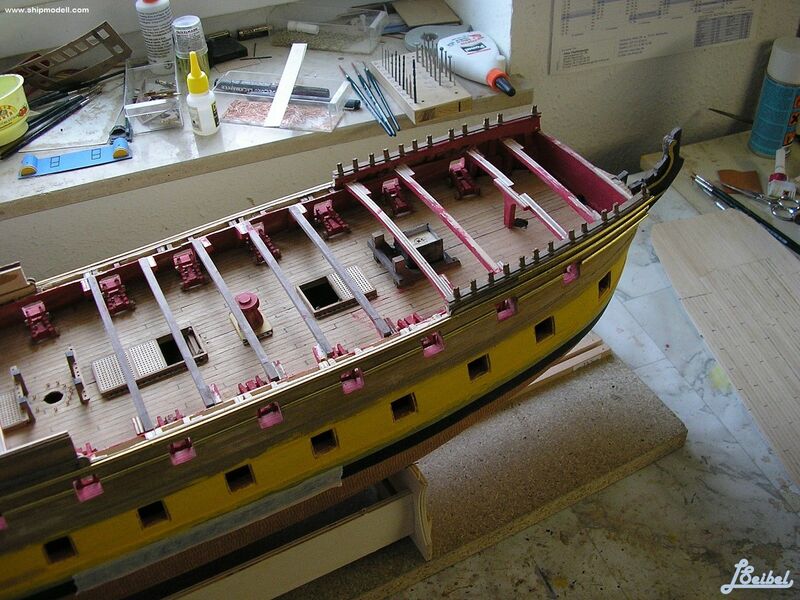 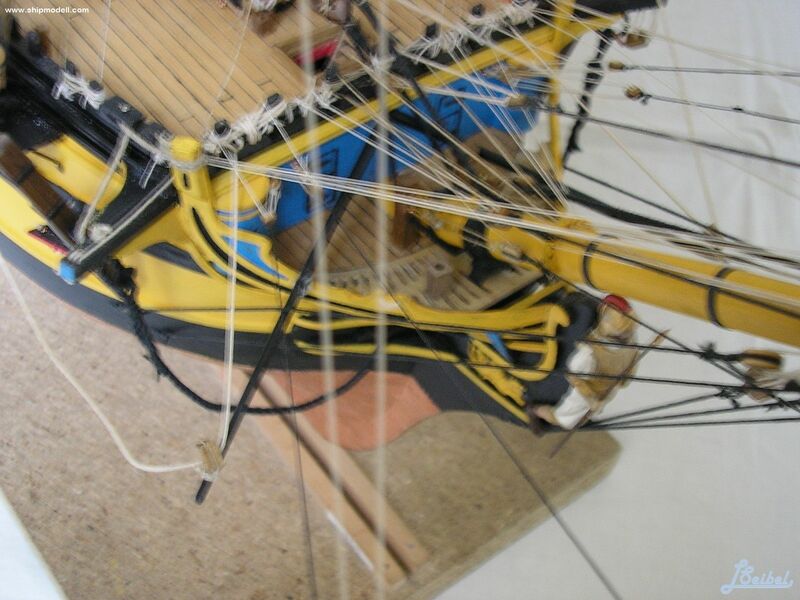 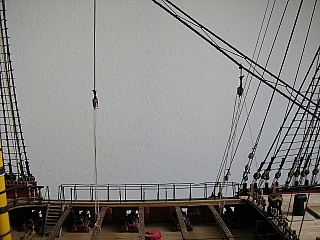 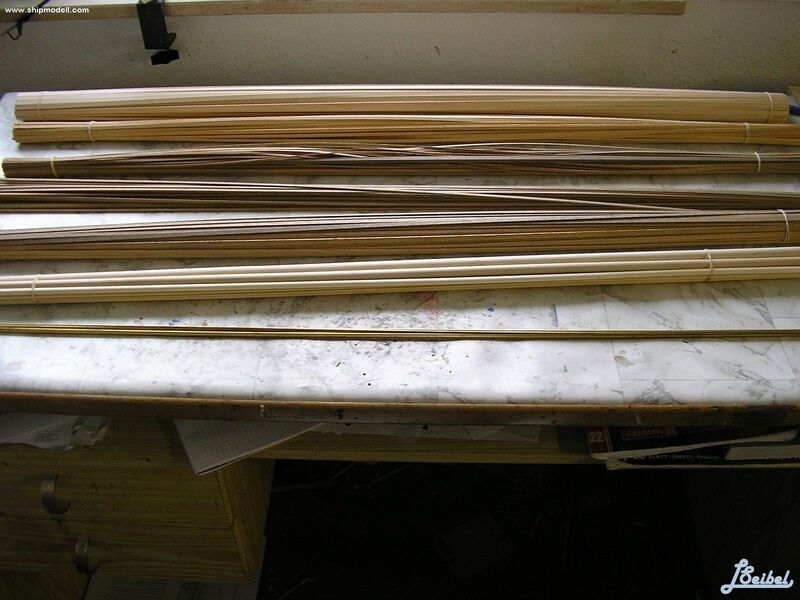 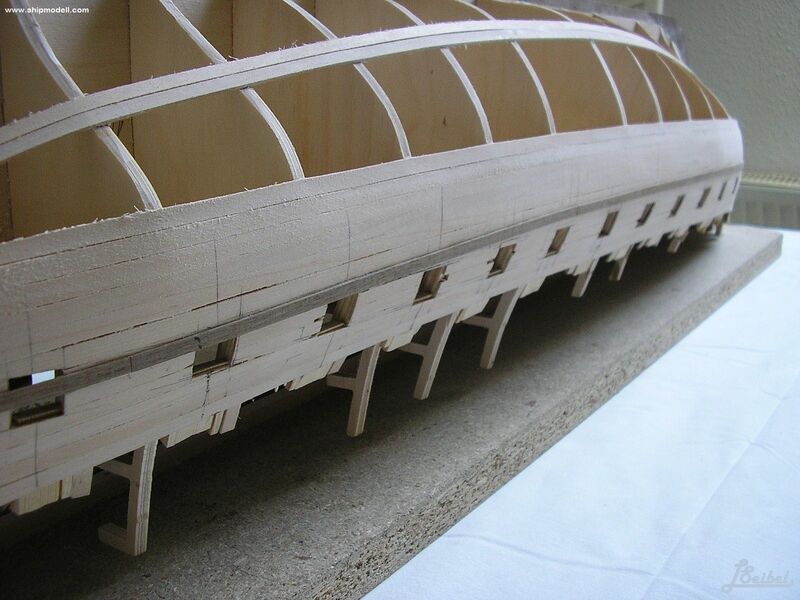 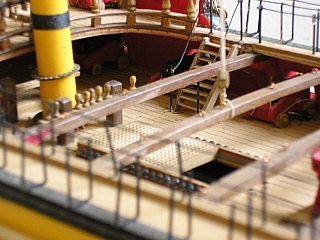 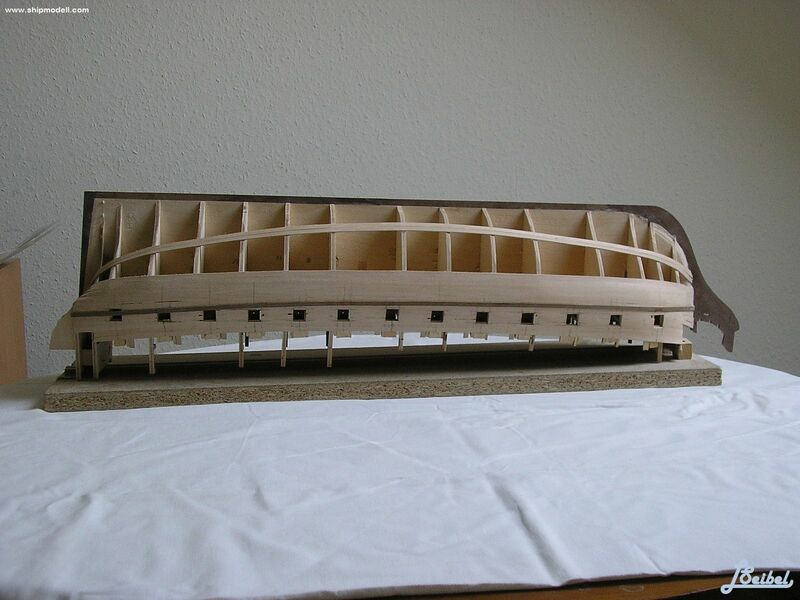 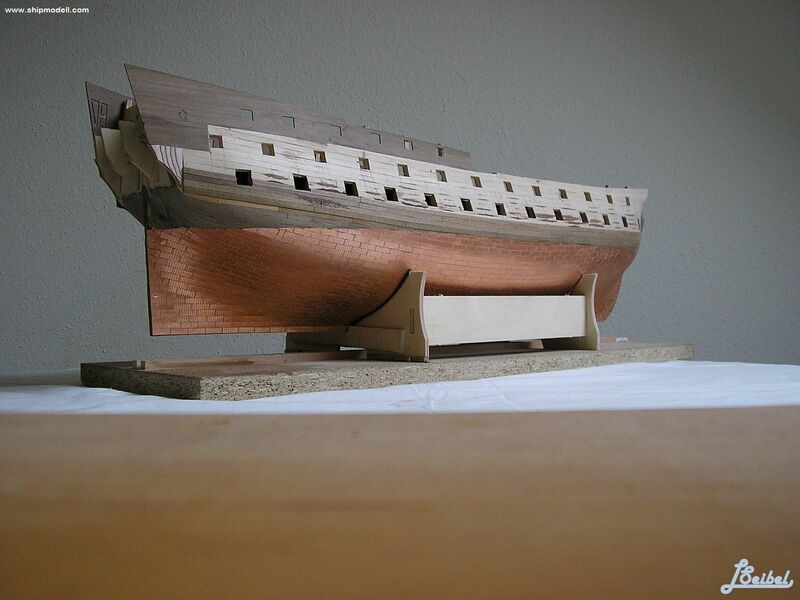 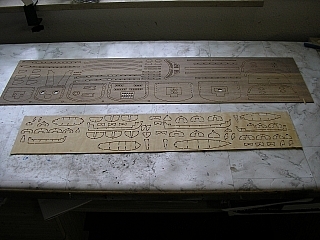 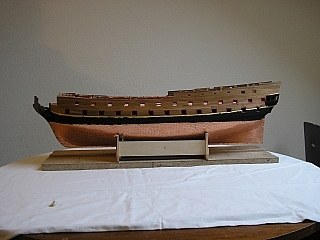 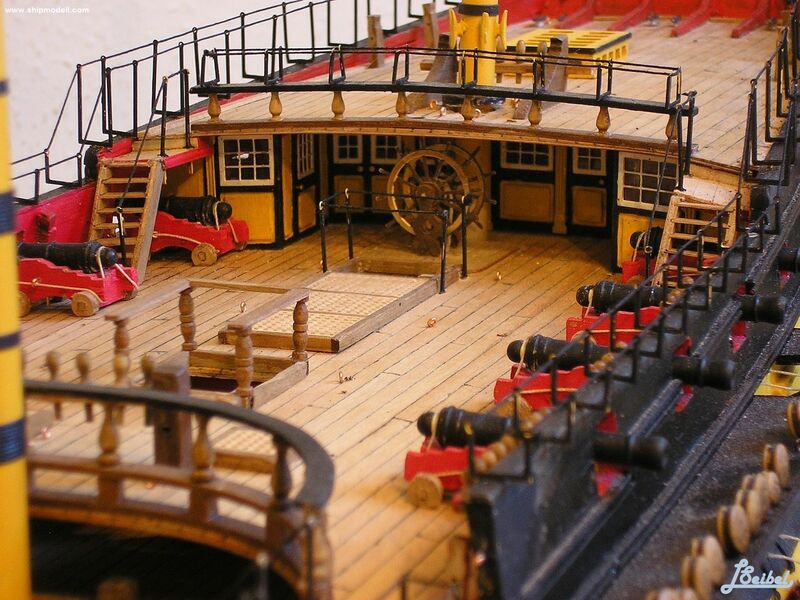 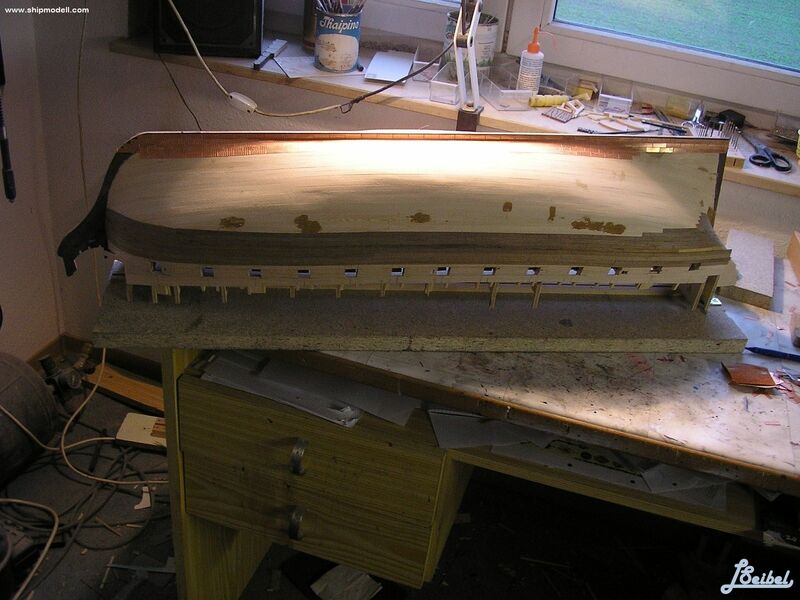 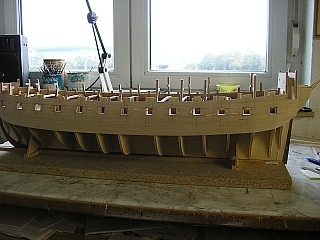 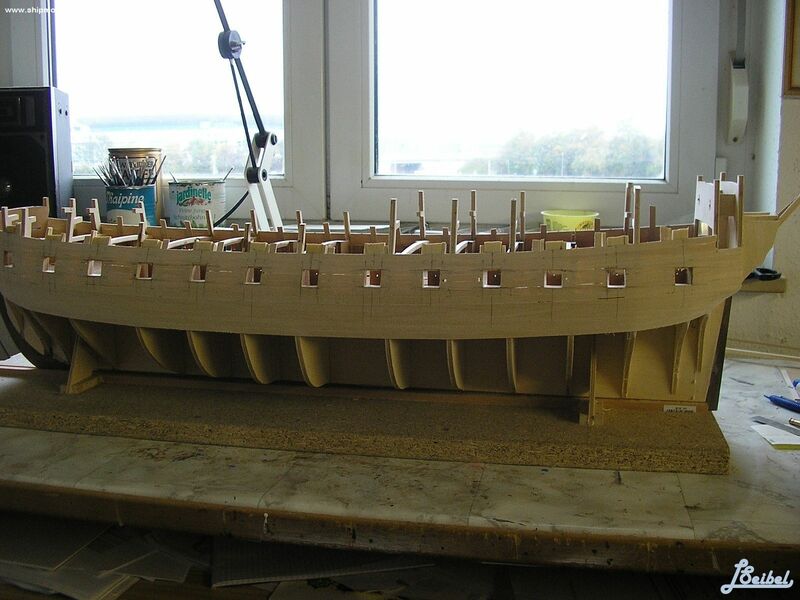 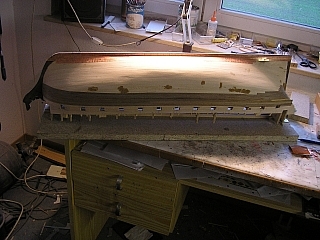 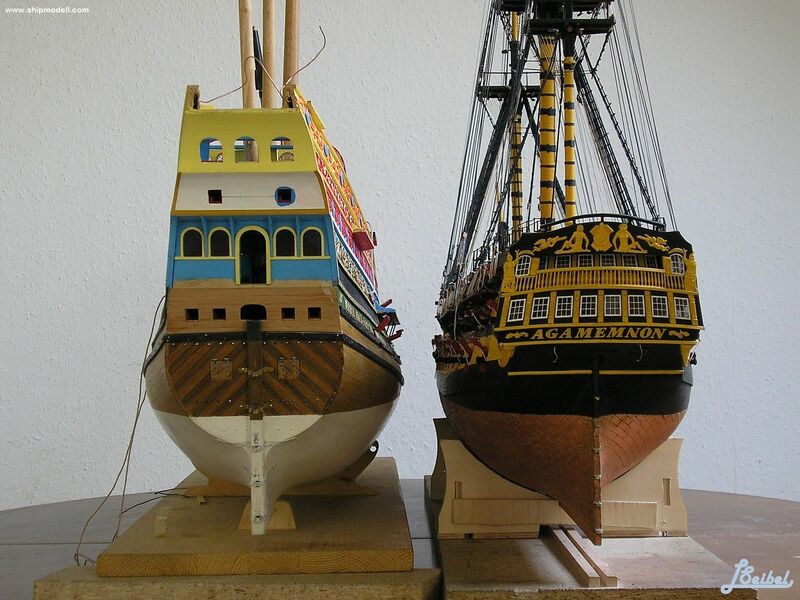 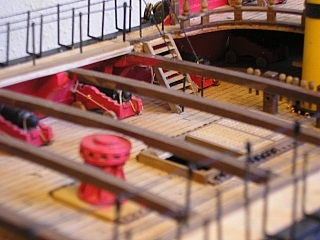 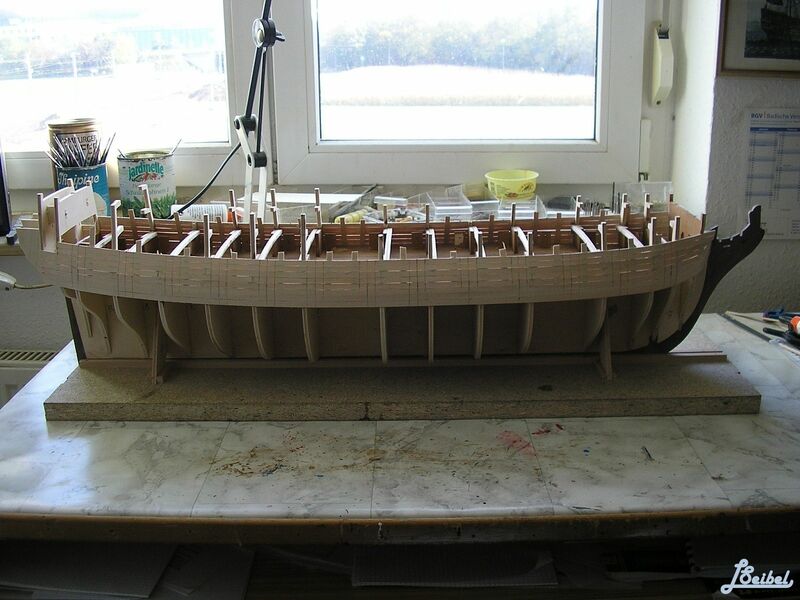 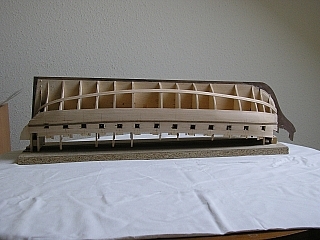 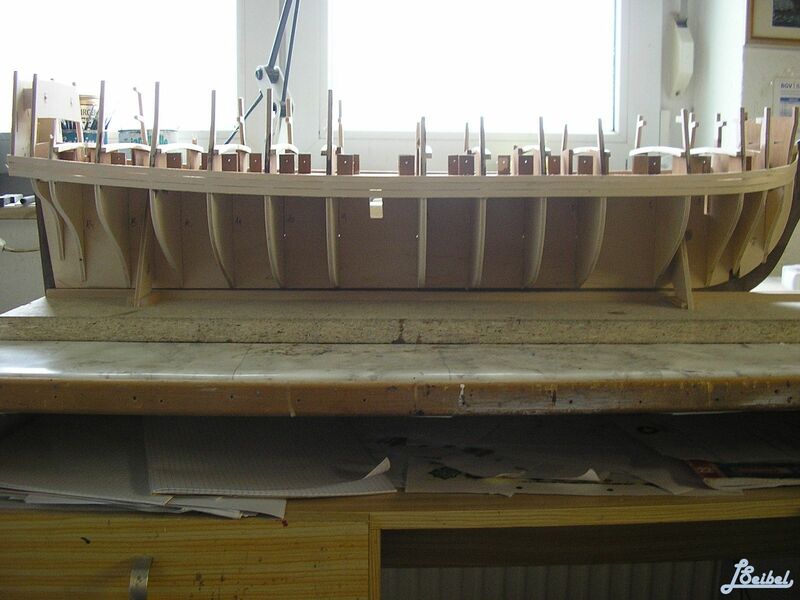 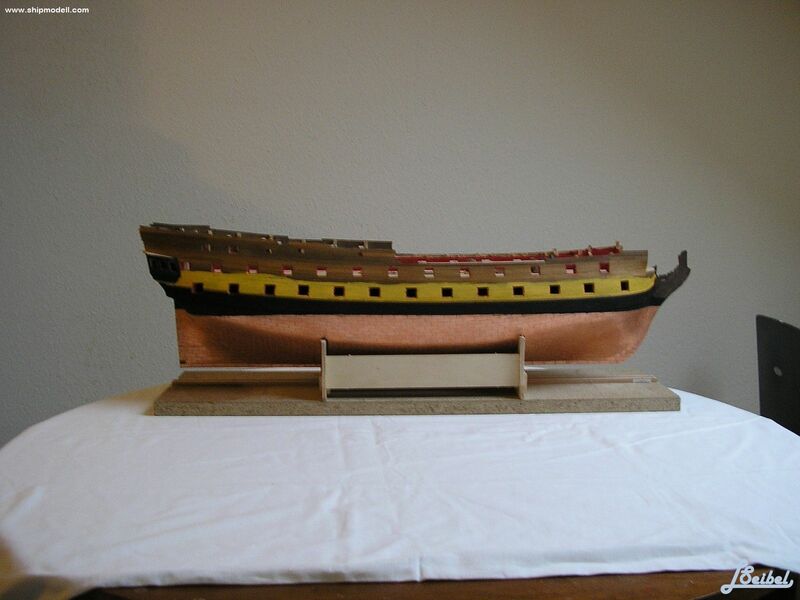 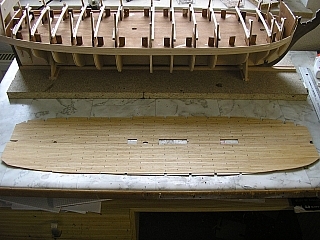 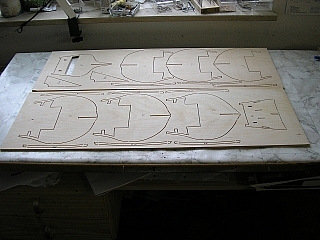 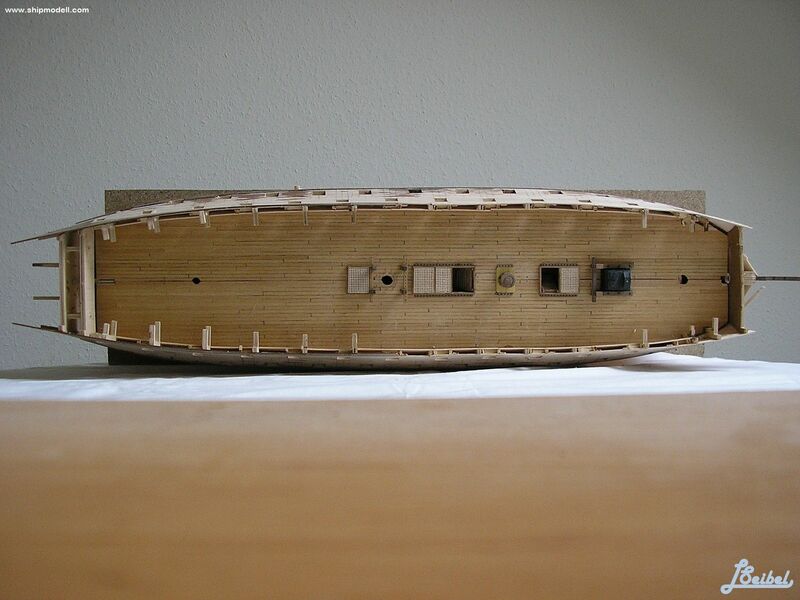 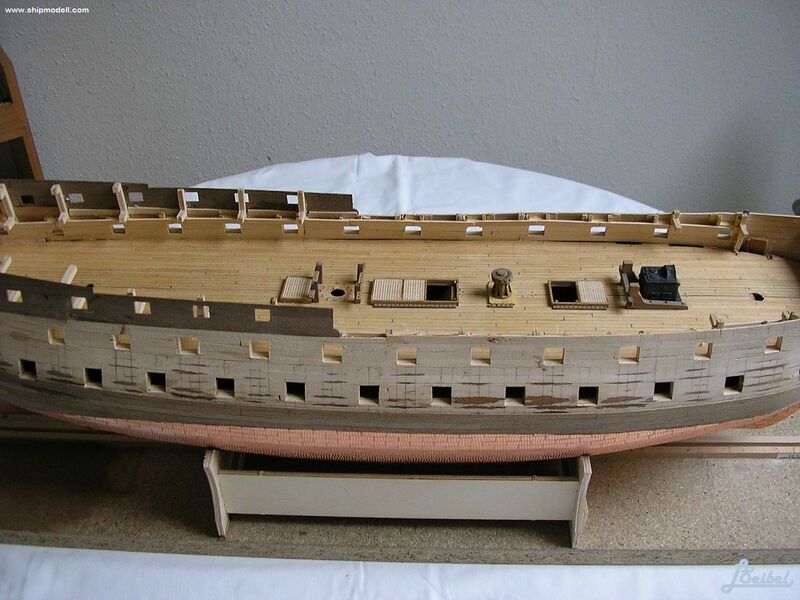 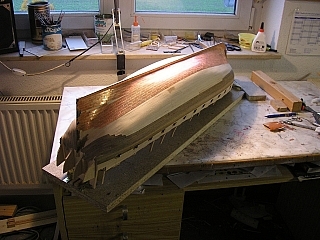 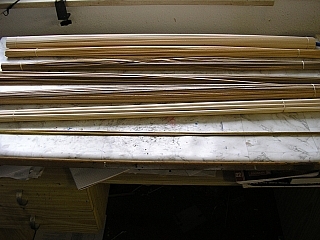 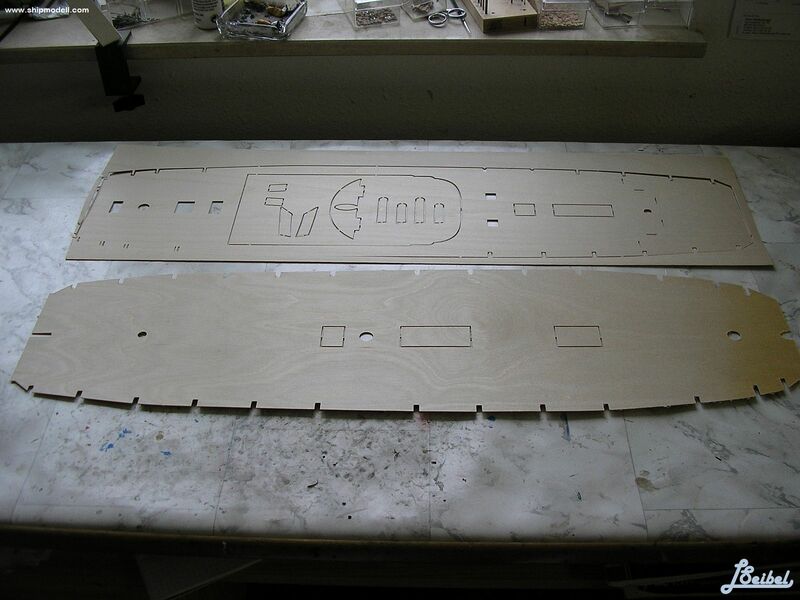 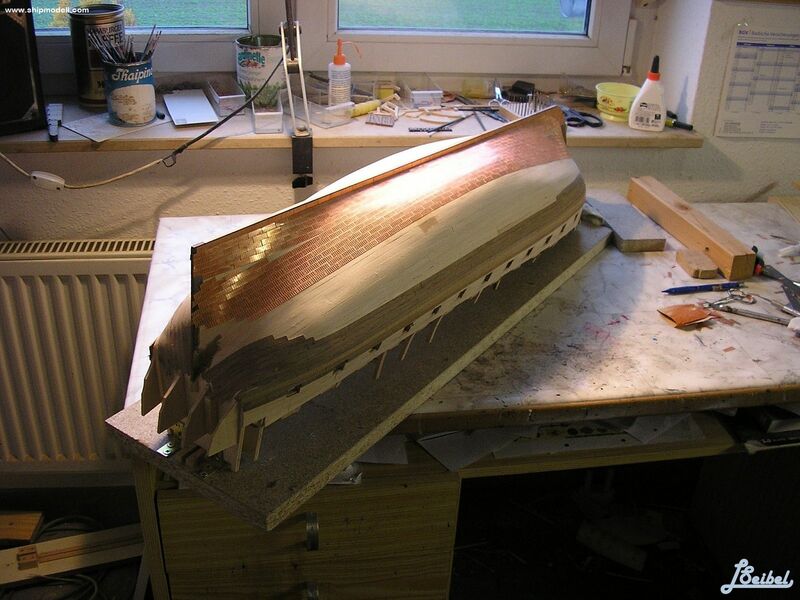 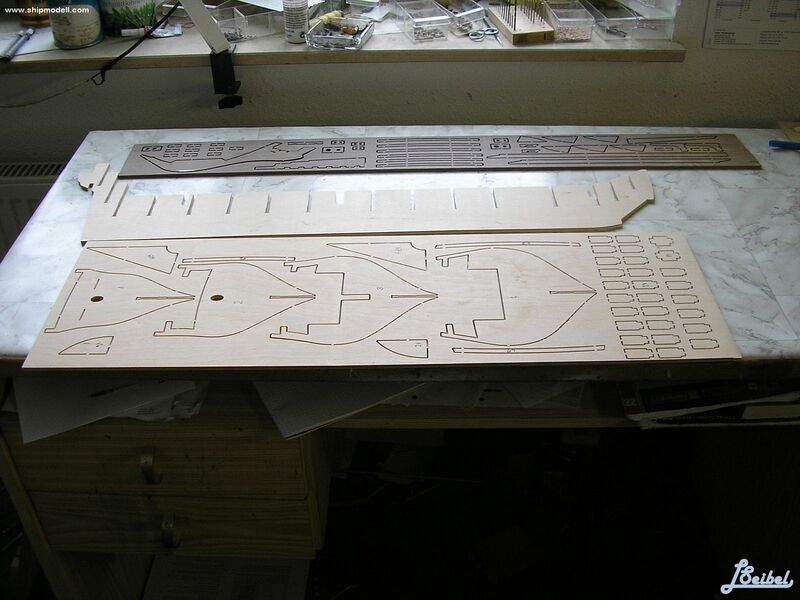 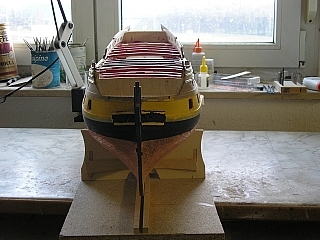 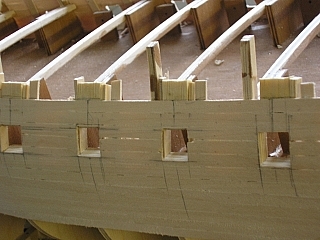 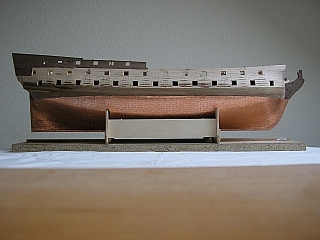 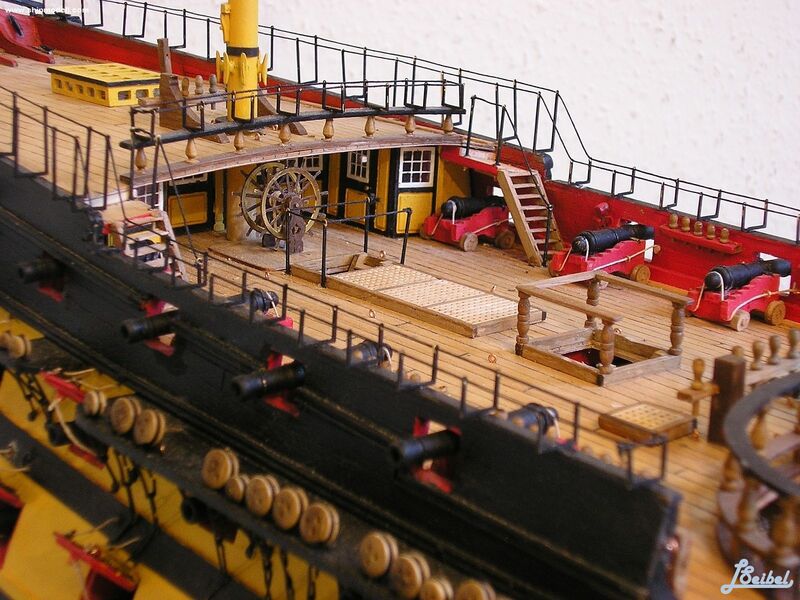 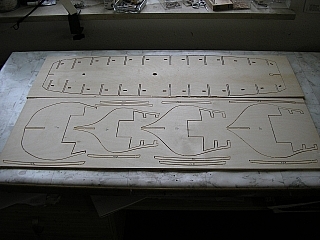 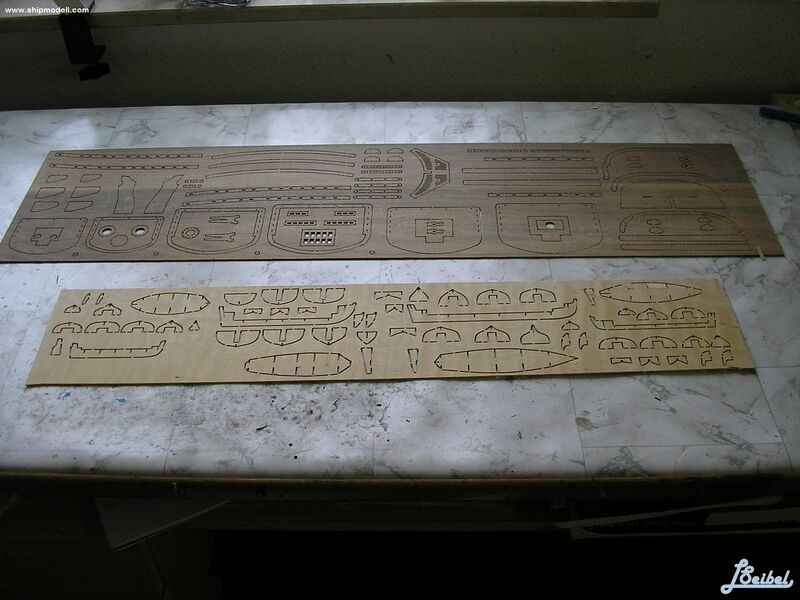 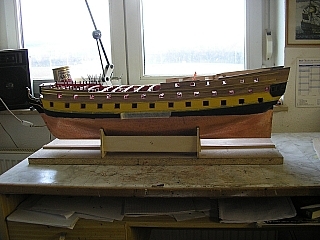 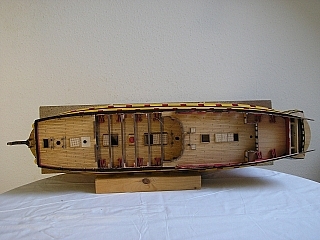 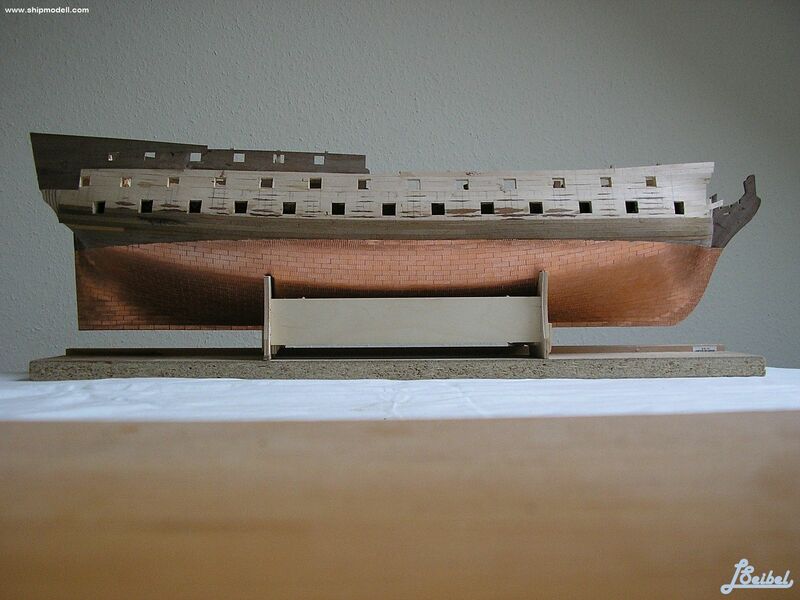 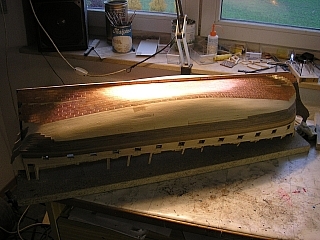 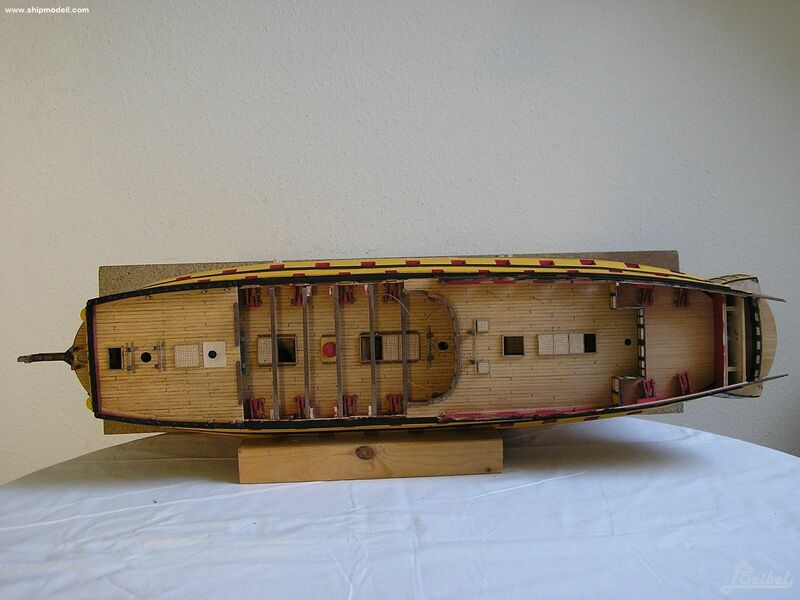 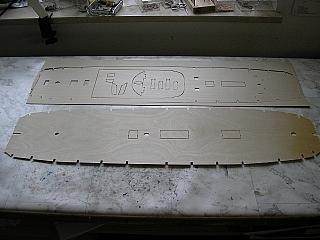 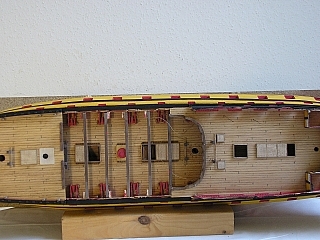 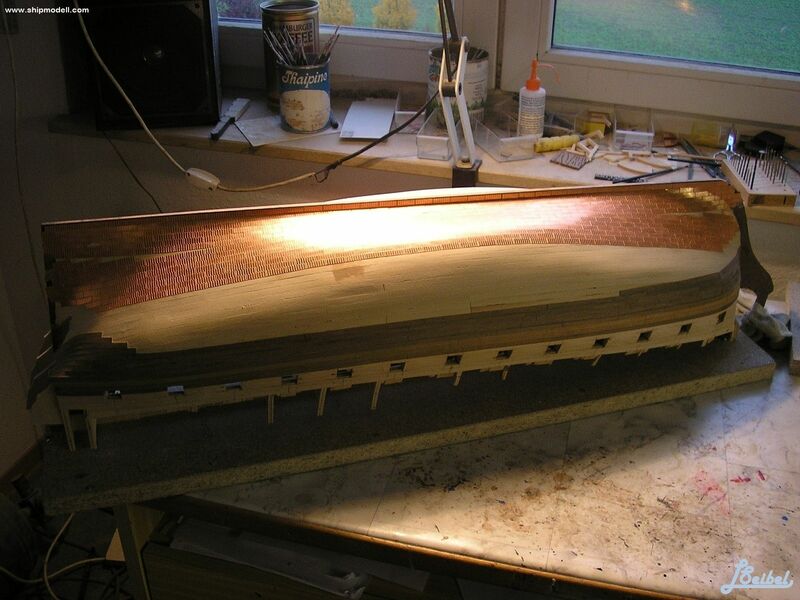 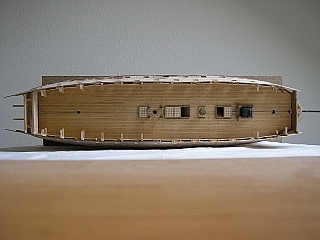 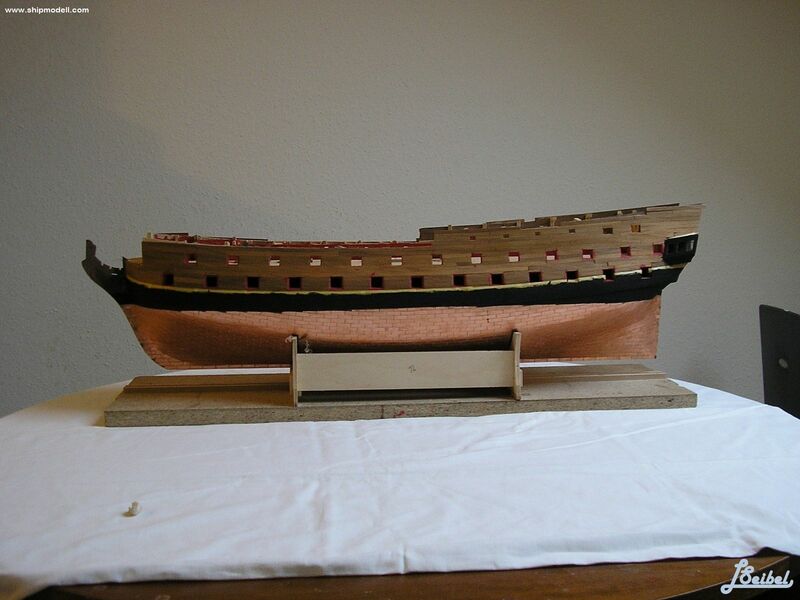 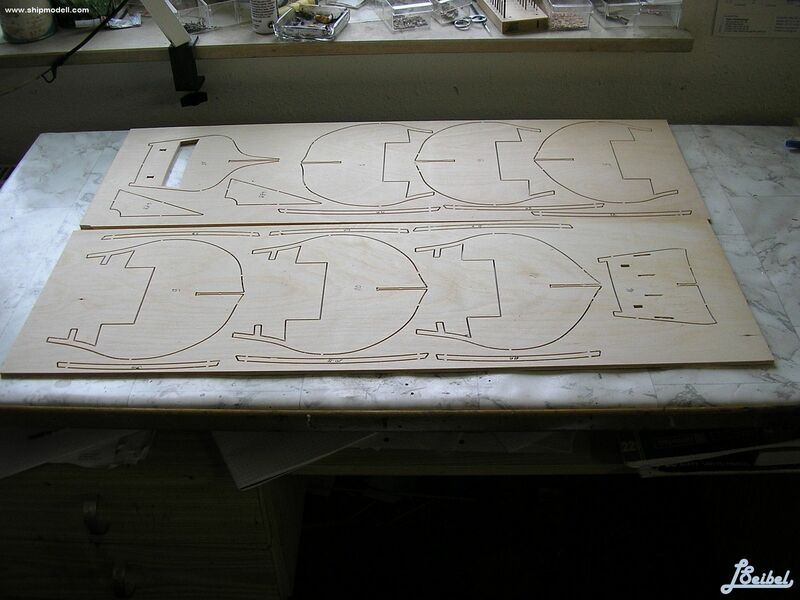 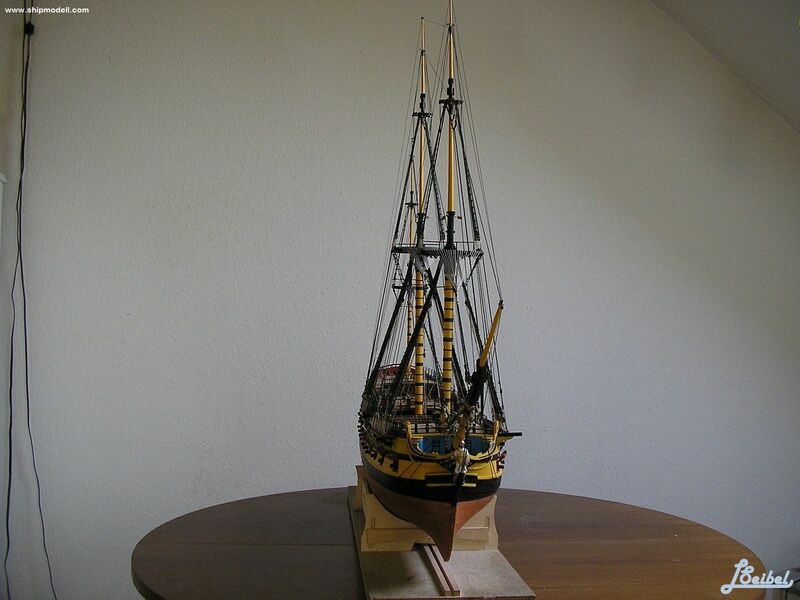 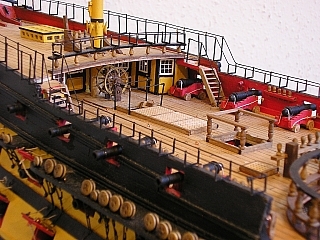 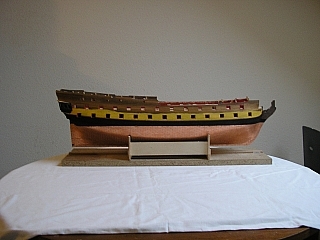 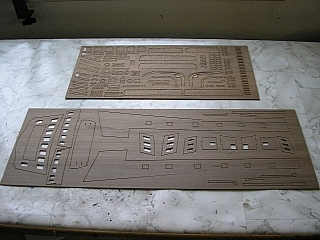 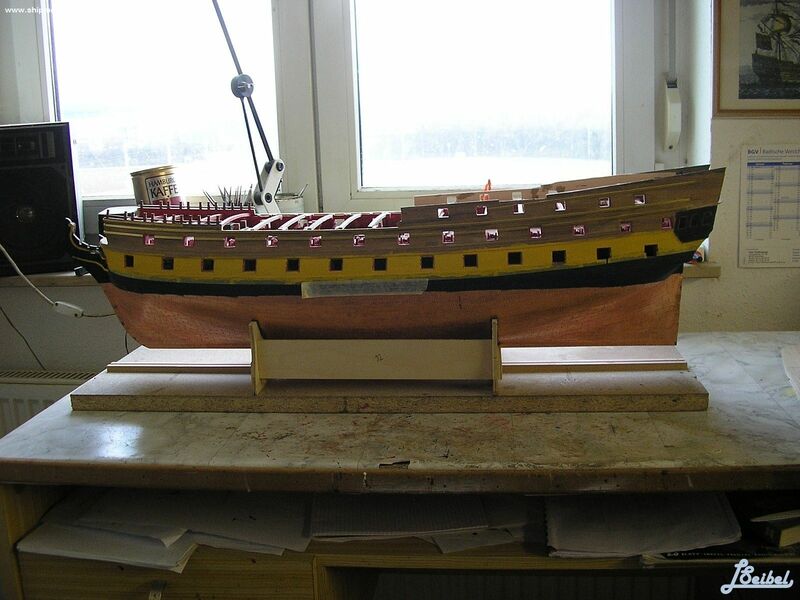 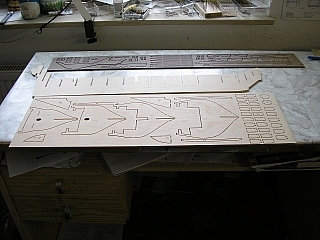 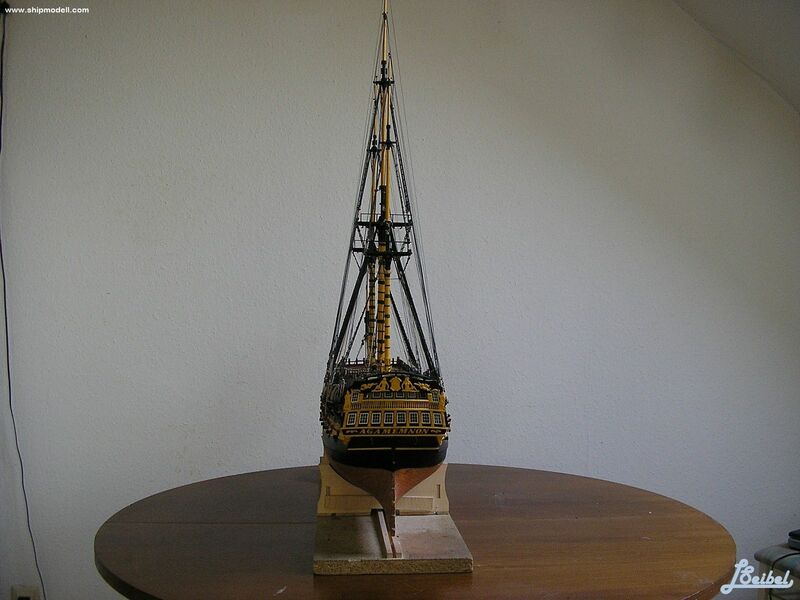 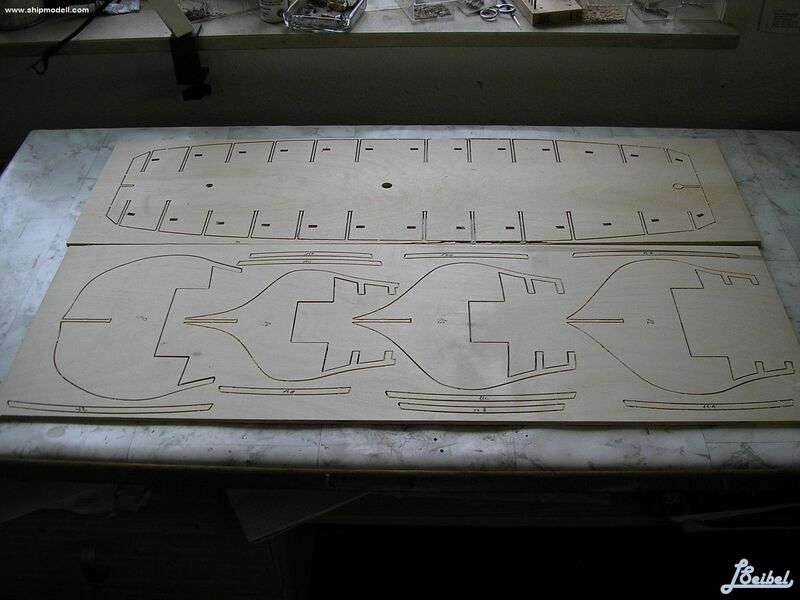 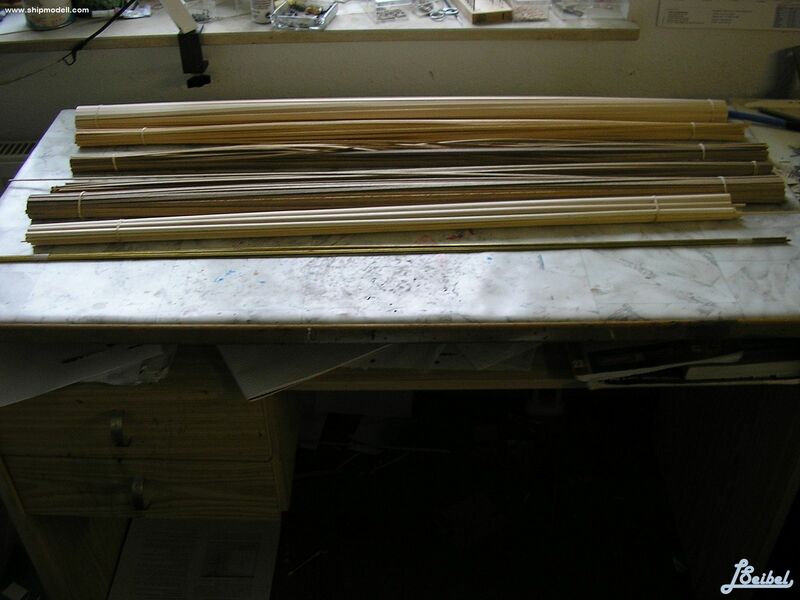 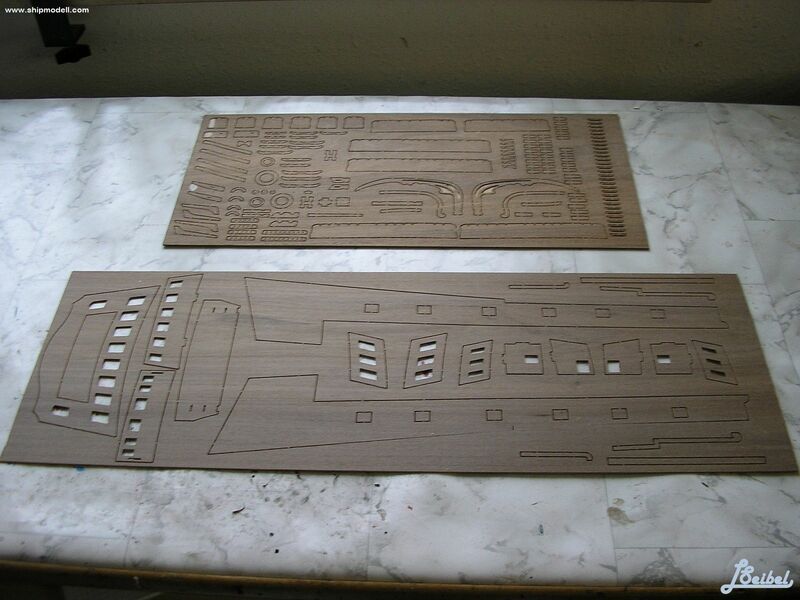 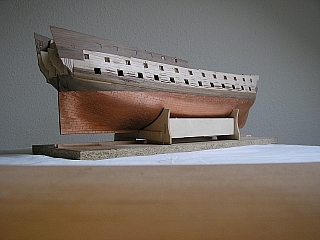 All hands and most of the ship's stores were saved, but the condition of the ship's timbers made it impossible to free the ship; her captain was cleared of responsibility for the ship's loss thanks to documents detailing her defects. 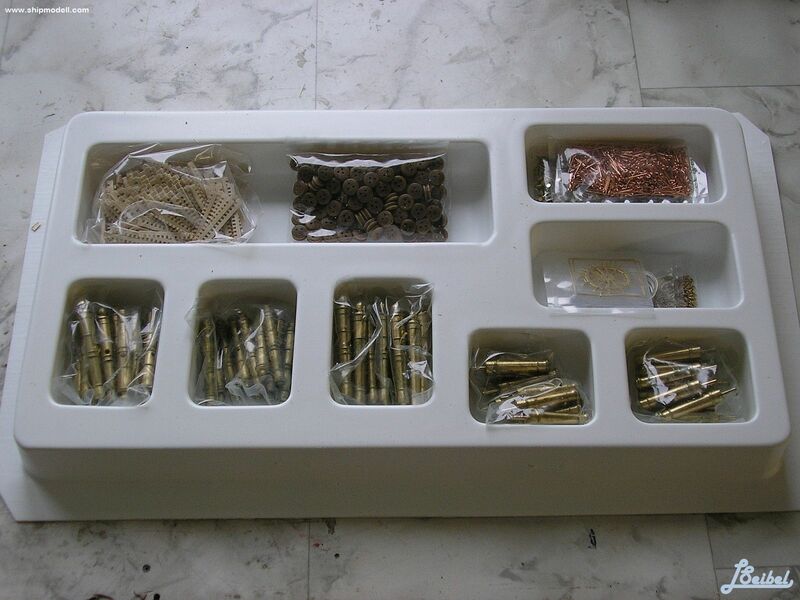 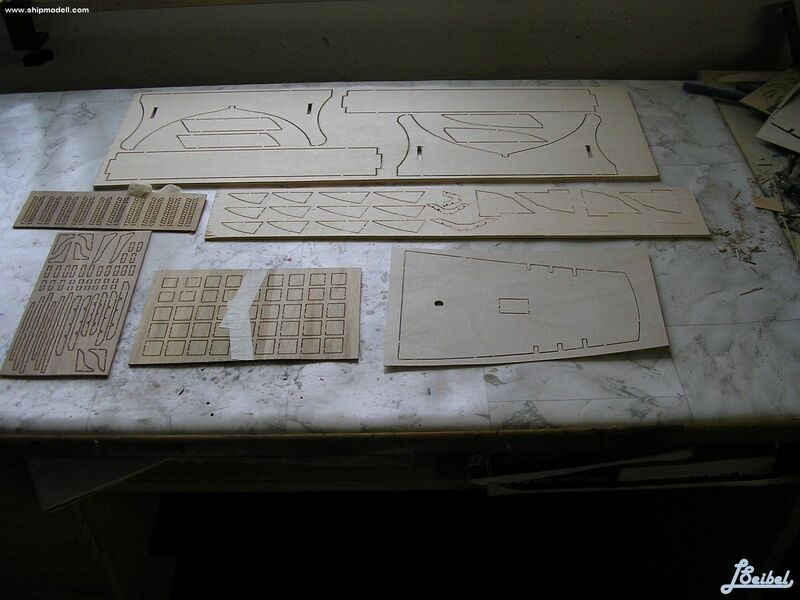 Recently, the wreck of Agamemnon has been located, and several artefacts have been recovered, including one of her cannons. 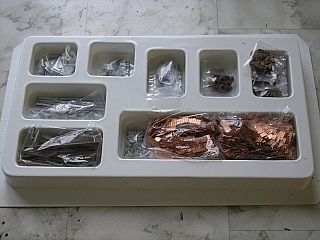 Az Agamemnon egyike volt annak a hét hajónak, amiket hasonló terv alapján épitettek. 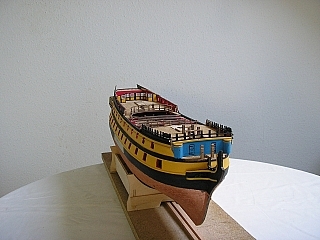 A tervet az a Sir Thomas Slade készitte, aki a hires Victoryt is tervezte. 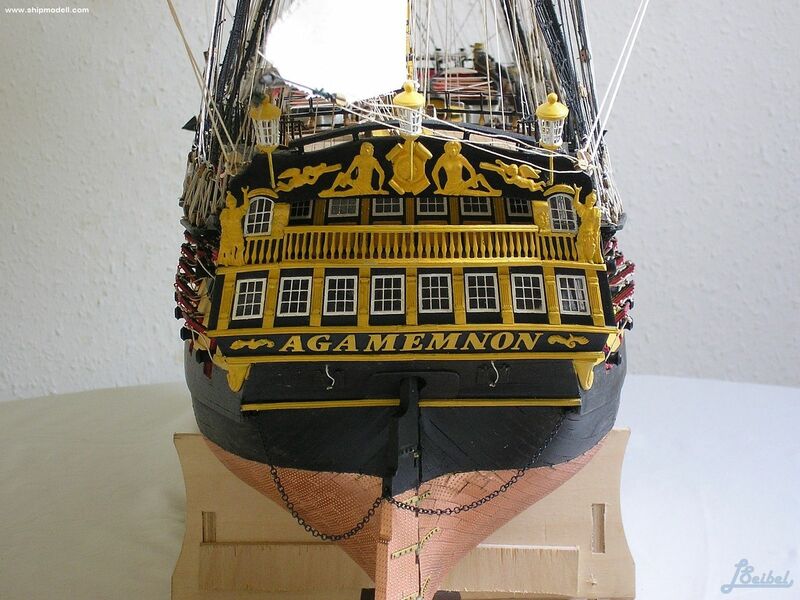 Az Agamemnon a harmadik volt ebben az osztályban, az elsö volt 1762-ben az Ardent, követte az Raisonable, ami 1763-ban lett a tökére fekteve.A harmadikként jött az Agamemnon, utánna 1778-ban a Belliqueux, 1779-ben a Stately, 1781-ben az Indefatigable és végül 1783-ban a Nassau. 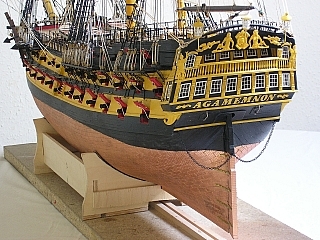 Az Agamemnon 1777-ben Bucklers Hard-on lett gerincre fektetve, s 1781 Április 10-én futott le a sólyáról. Egy harmadosztályú hajó – mint az Agamemnon – épitése meglehetösen sokba került. 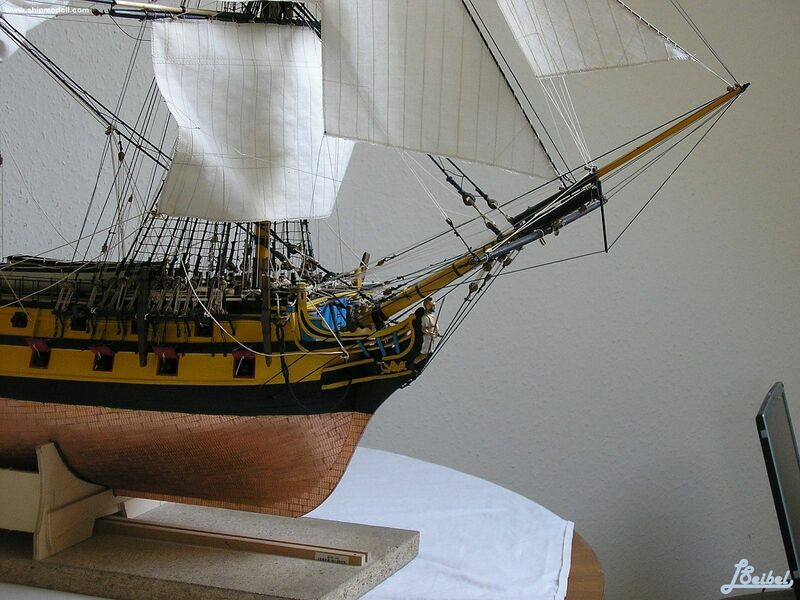 A hajótest konstrukciója – árbocokkal és vitorlarudakkal az angol Marineminisztériumnak 20.579 fontba került, (Ma ez kb. 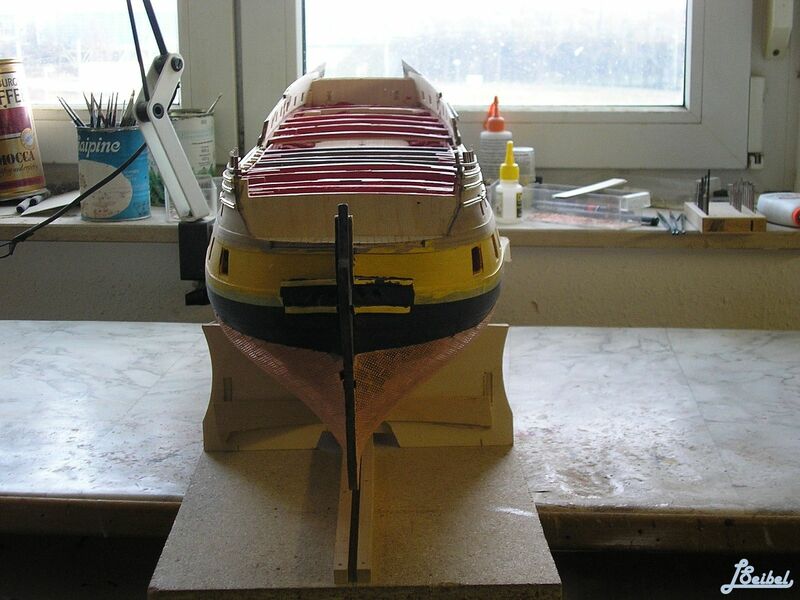 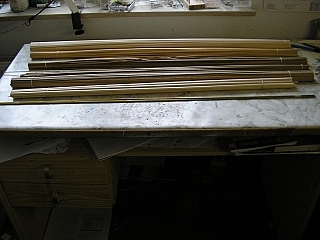 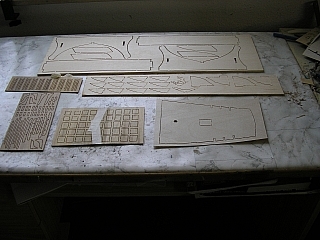 12 milló font lenne)s ebbe az összegbe az ágyúk, vitorlák, kötelek, rézlemezek s más feleszerelések nem voltak benne.